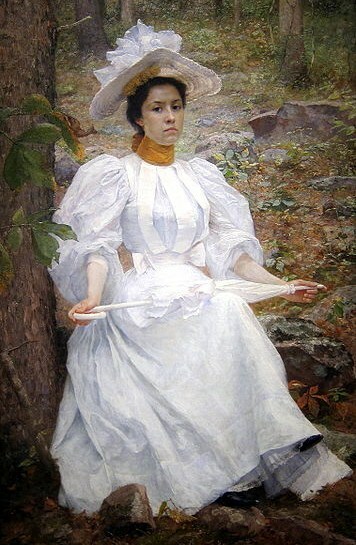 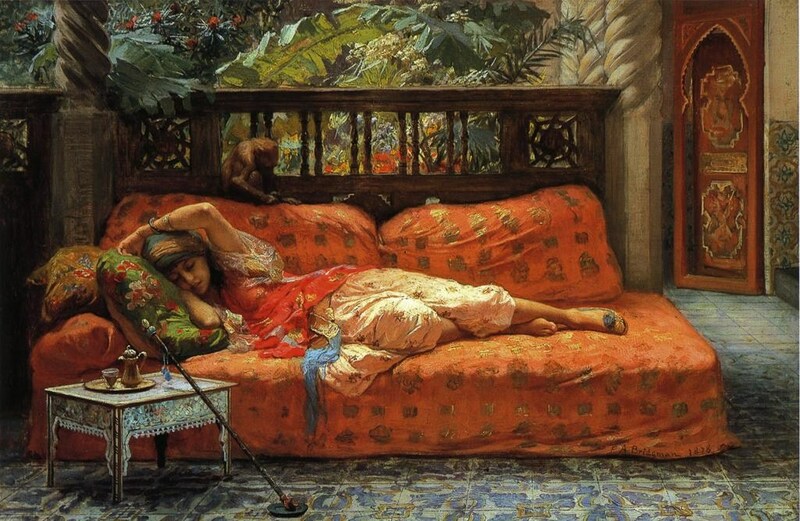 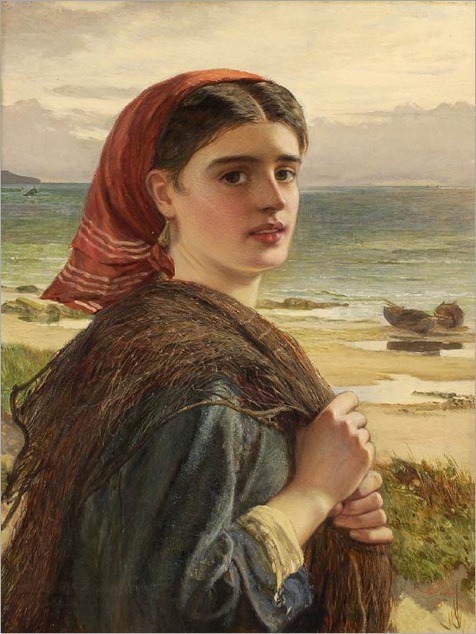 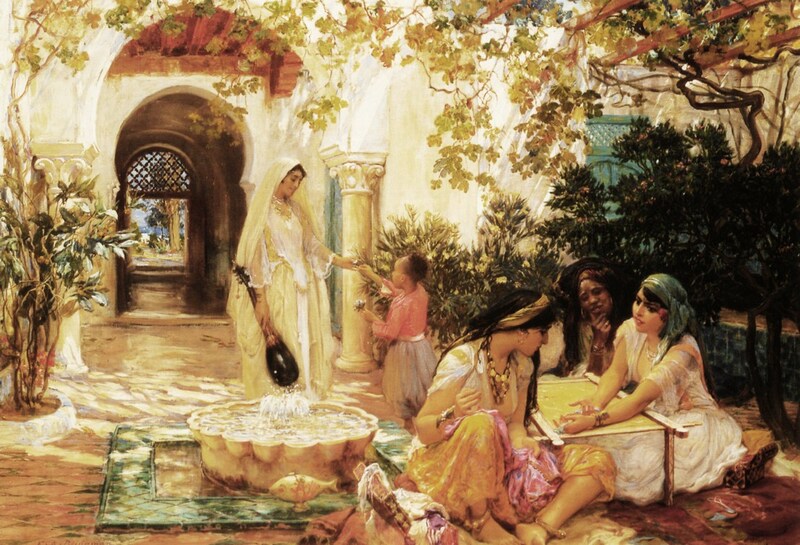 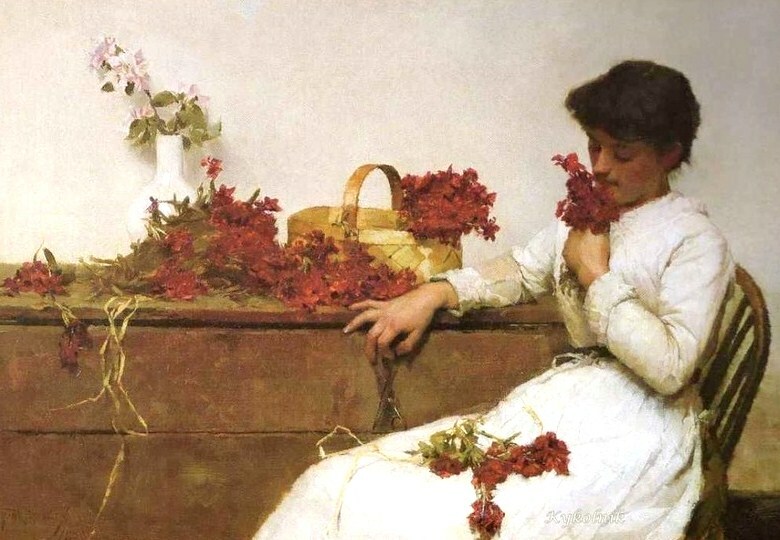 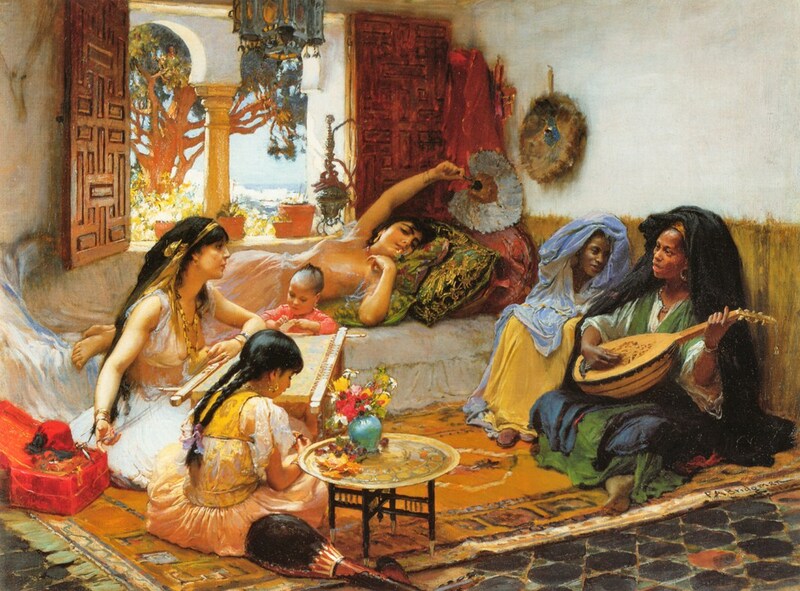 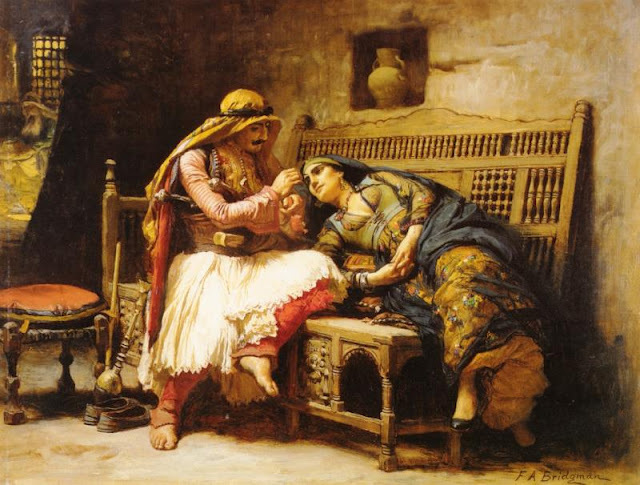 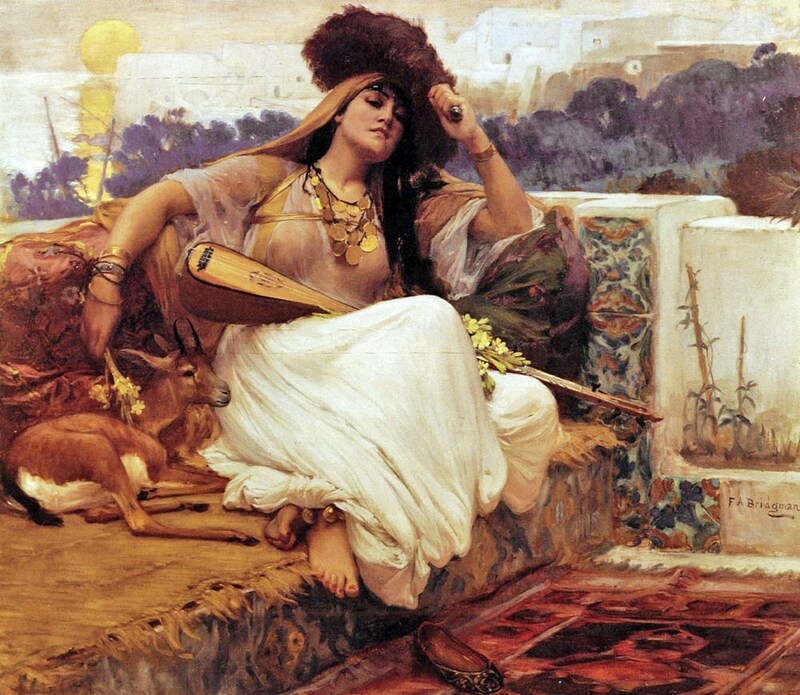 Frederick Arthur Bridgeman (1847–1928) born in Tuskeegee, Alabama, the son of a physician, would become one of the United States’ most well-regarded “Orientalist” painters. 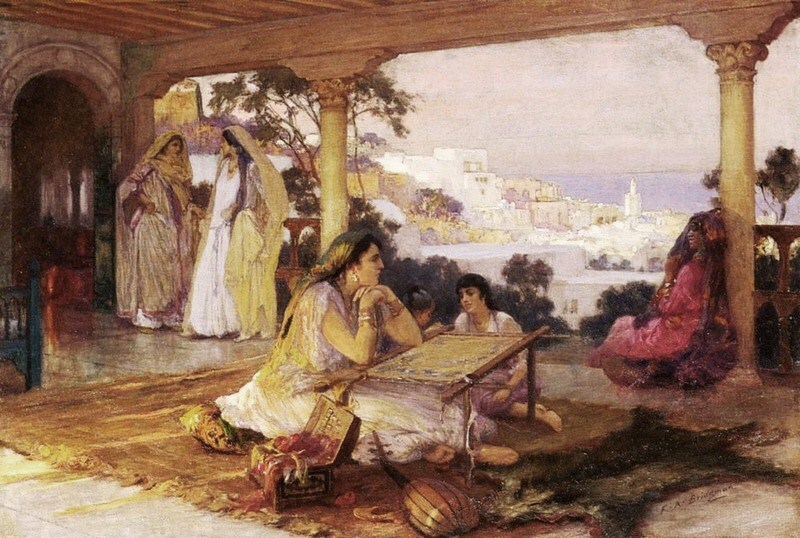 Bridgeman moved to Paris in 1866, and began traveling to North Africa soon after, amassing a huge collection of costumes & architectural pieces to use in his paintings. 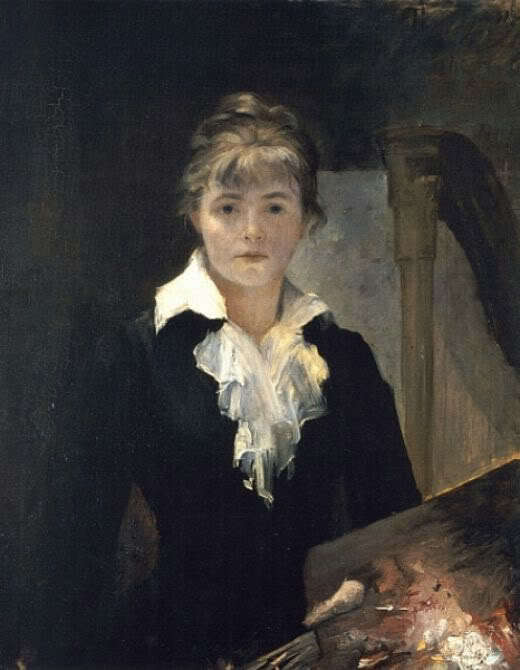 Fellow American painter John Singer Sargent noted that Bridgman’s overstuffed studio, along with the Eiffel Tower, were Paris’s must-see attractions. 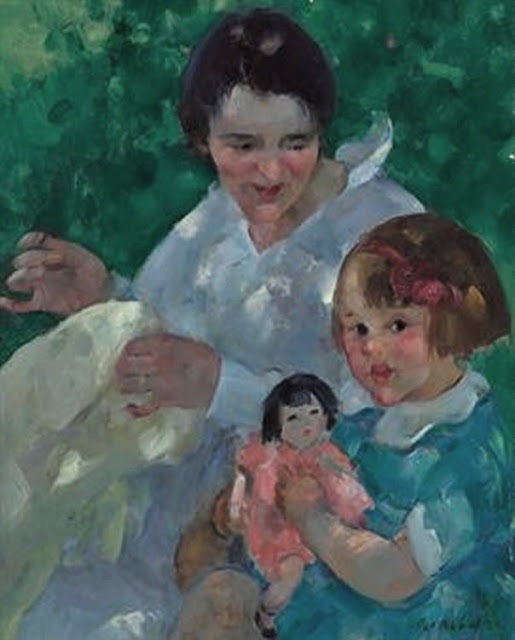 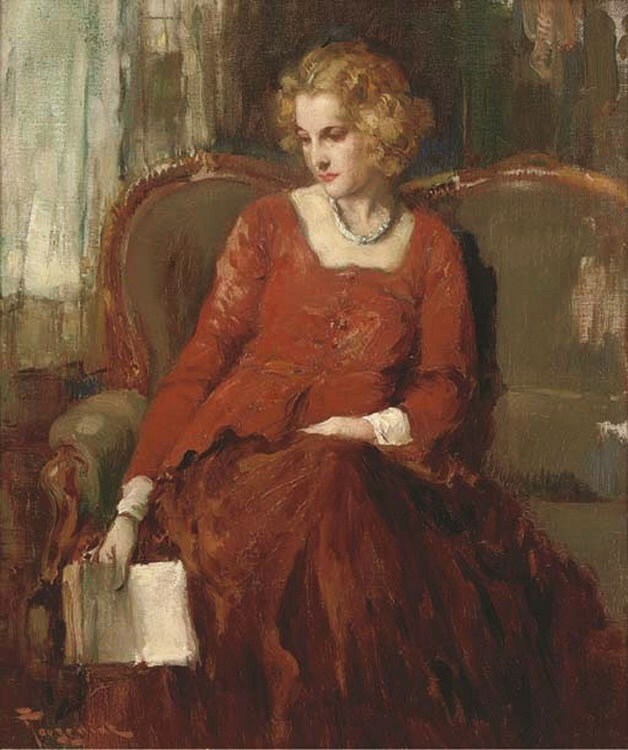 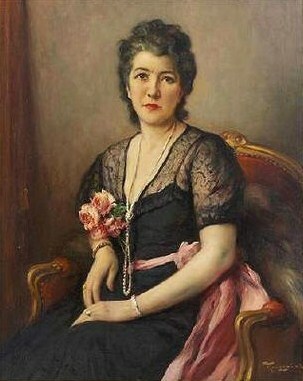 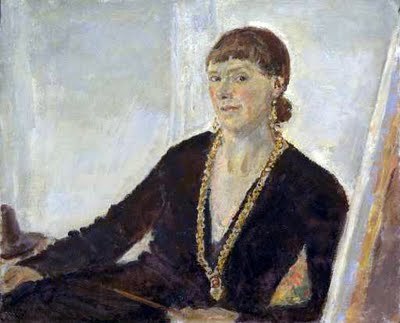 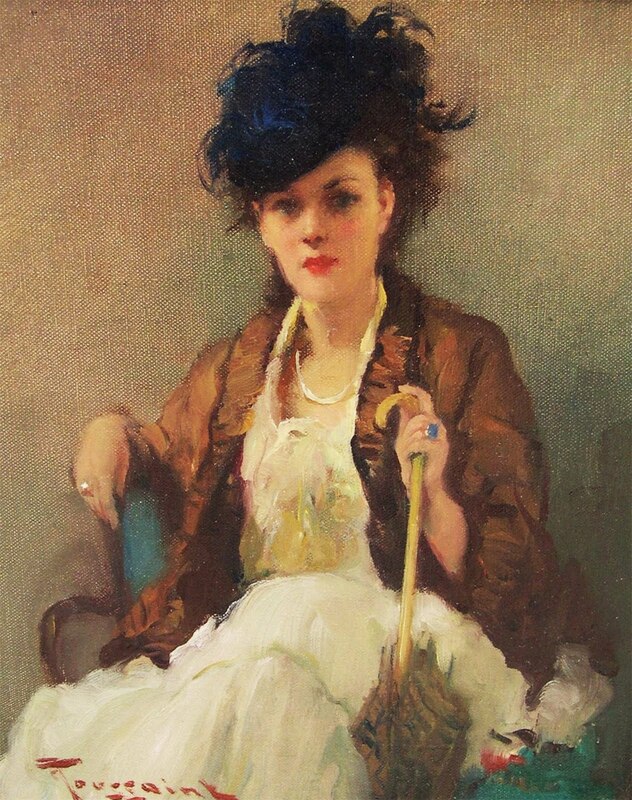 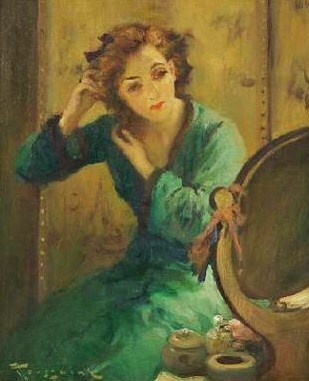 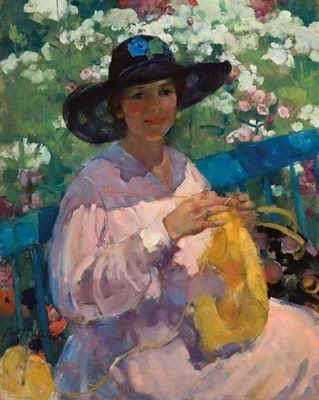 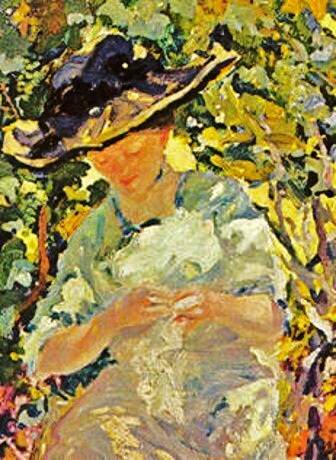 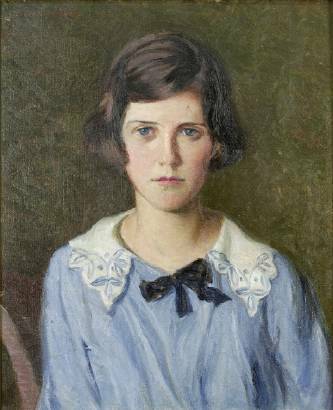 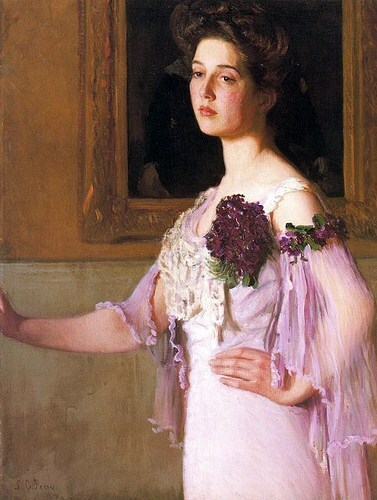 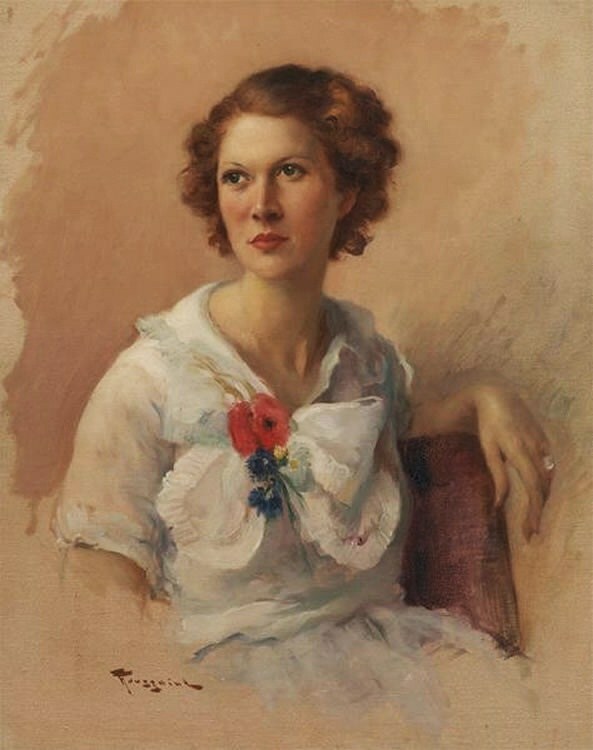 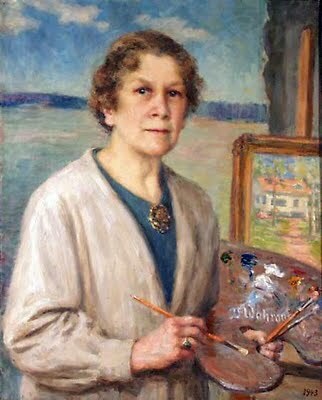 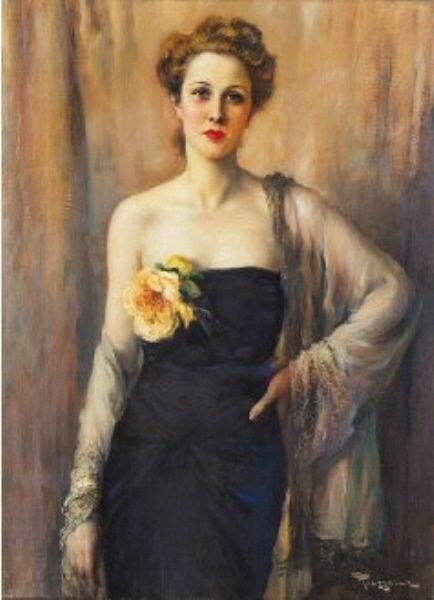 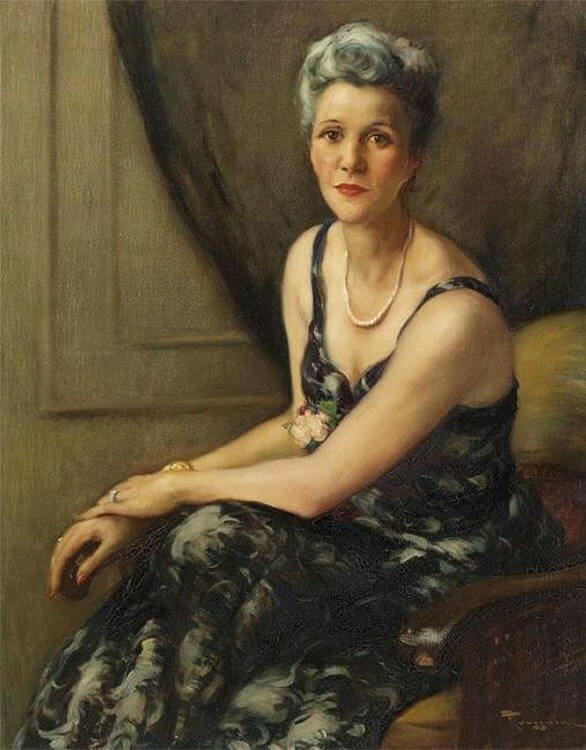 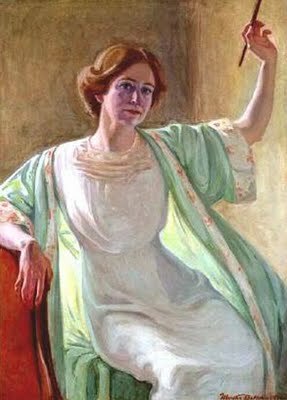 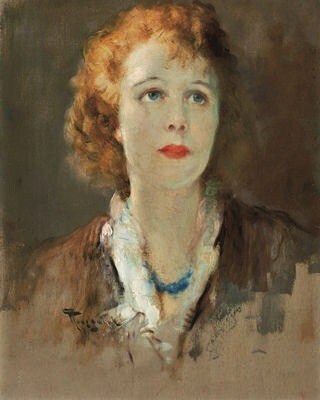 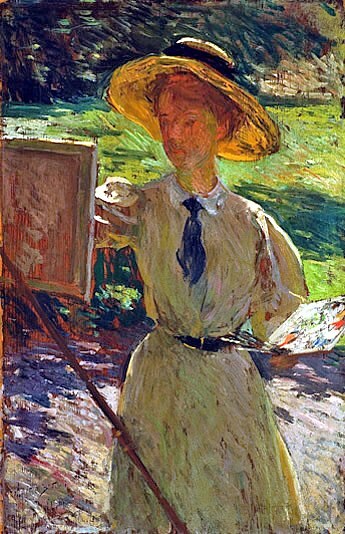 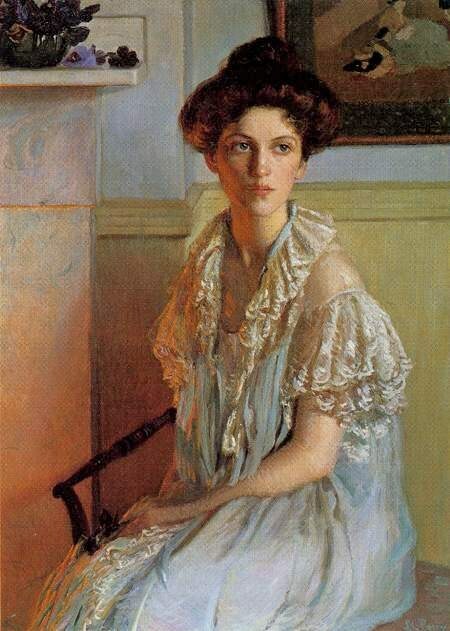 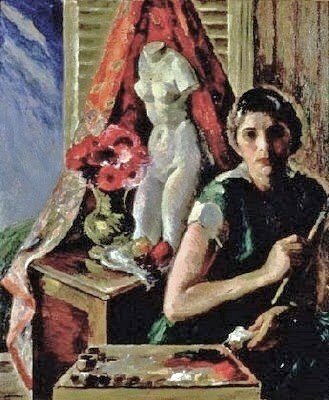 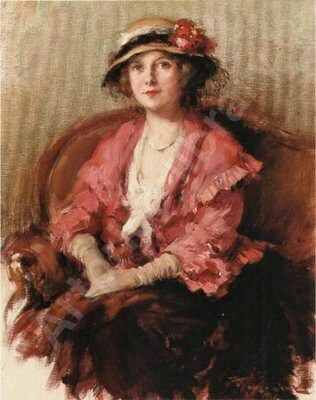 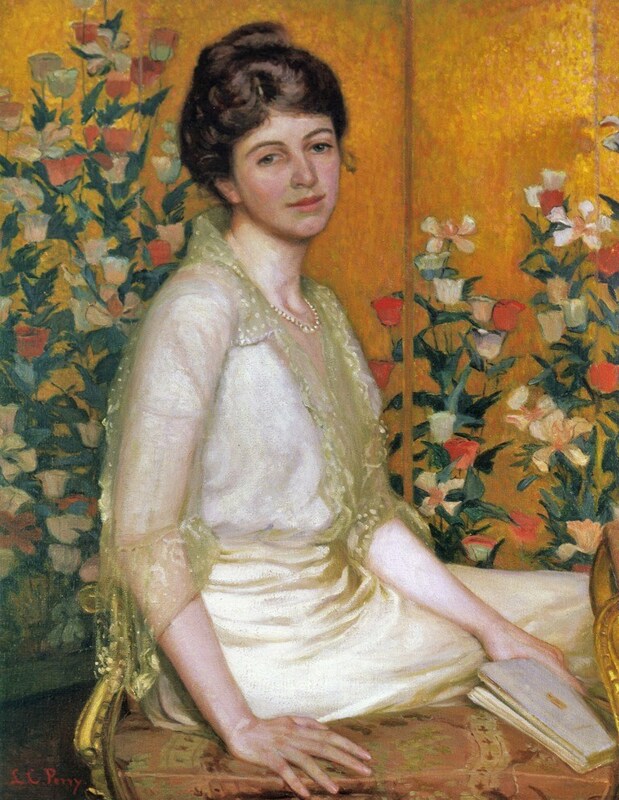 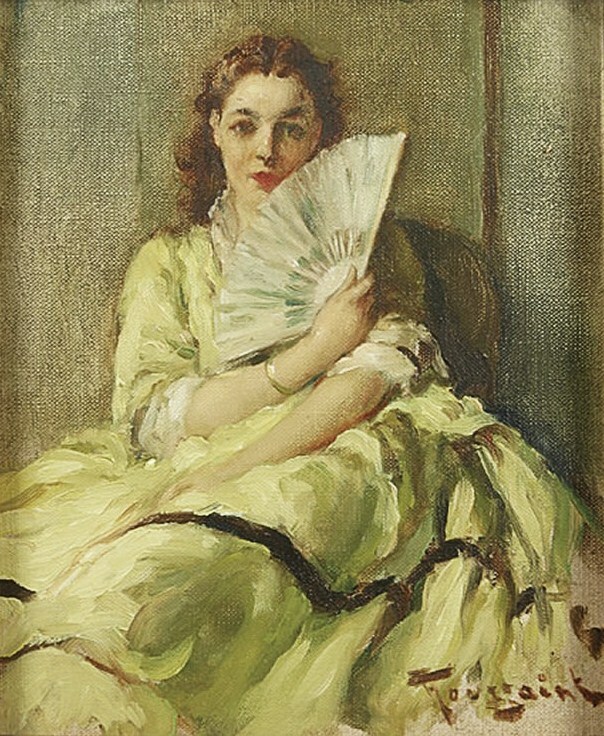 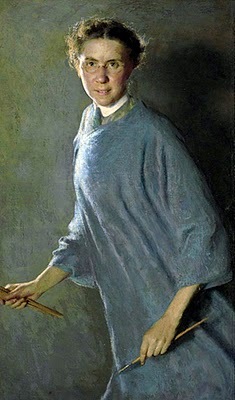 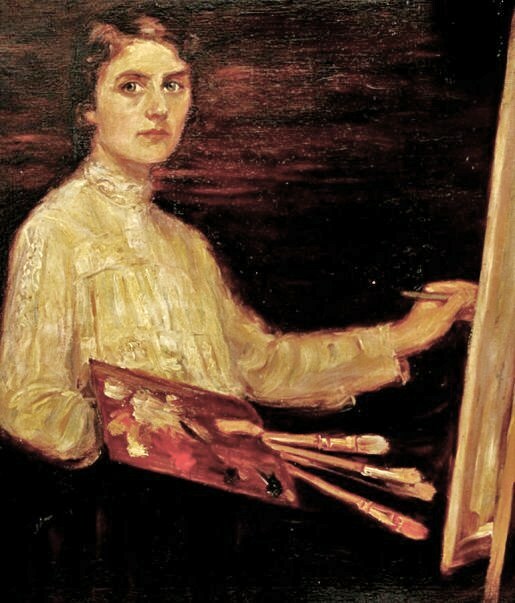 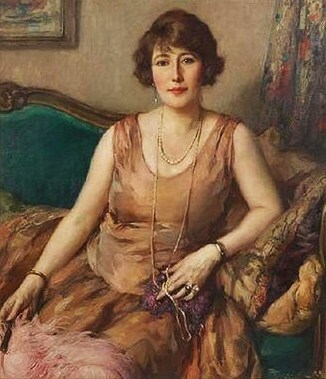 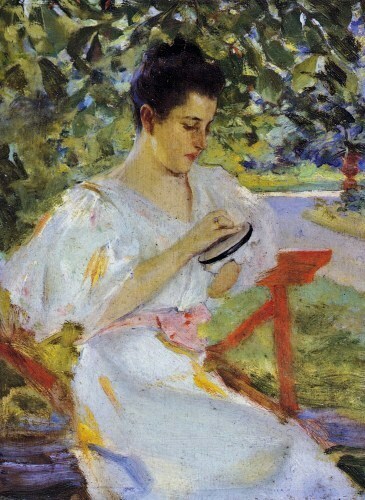 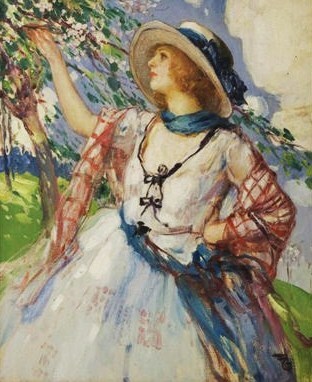 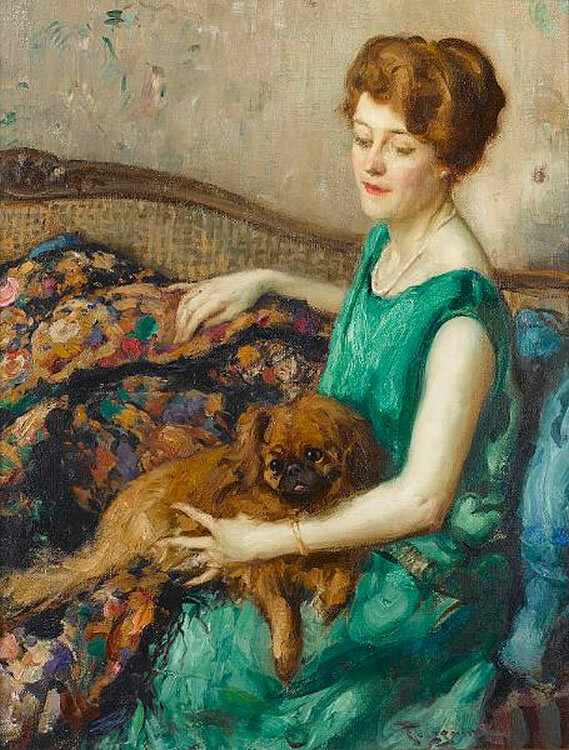 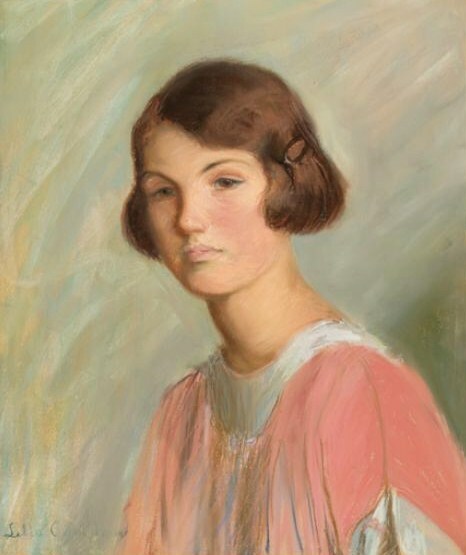 Although Lilla Cabot came from a privileged Boston family, she did not receive any formal art training, until she was 36. 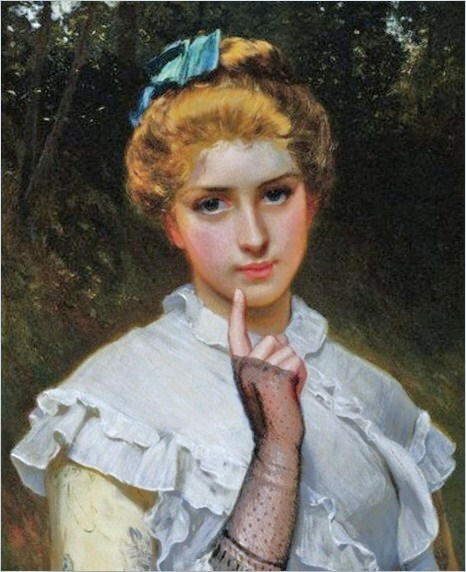 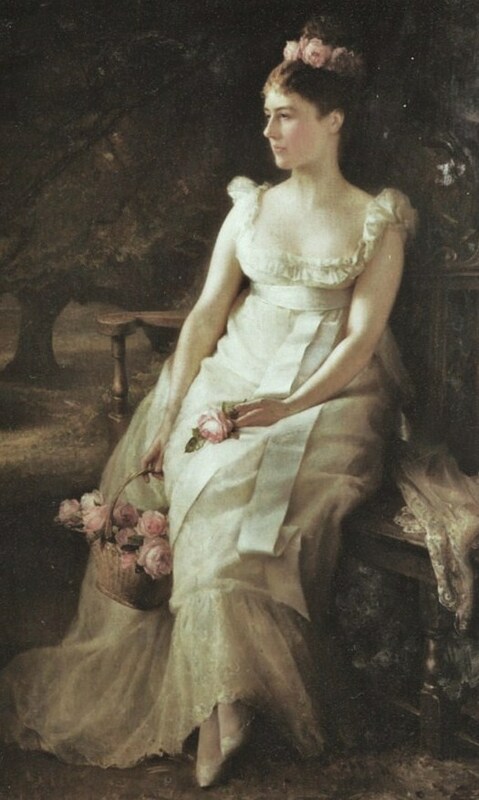 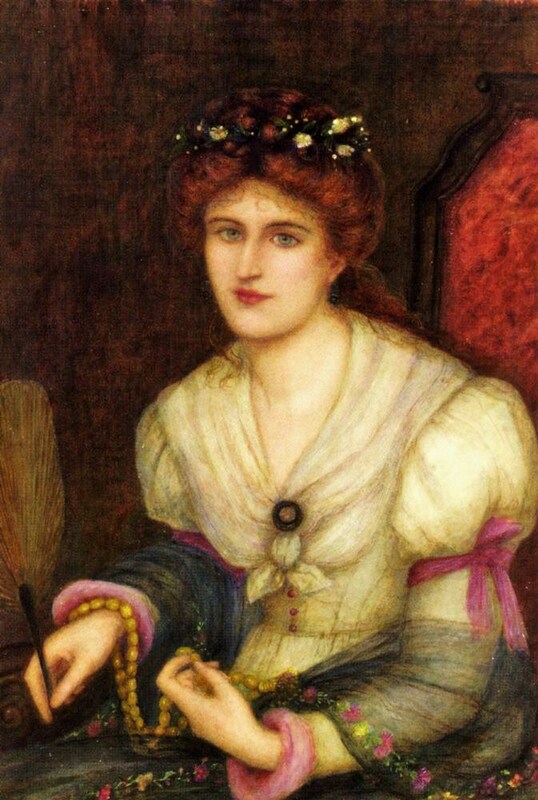 In 1874, she married Thomas Sargeant Perry, a professor of 18th-century English literature, & they had 3 daughters. 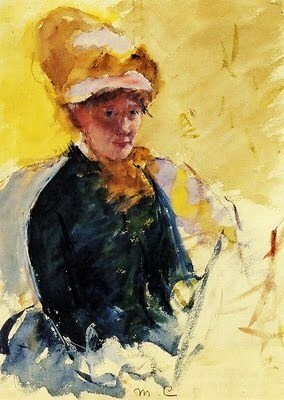 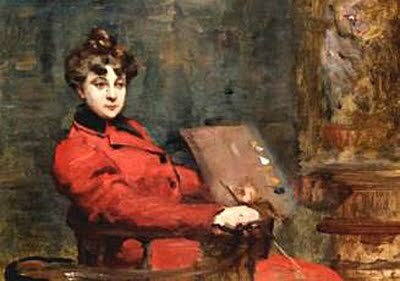 The young family traveled to Paris from 1887 to 1889, where Lilla studied painting at the Académie Colarossi & the Académie Julian. 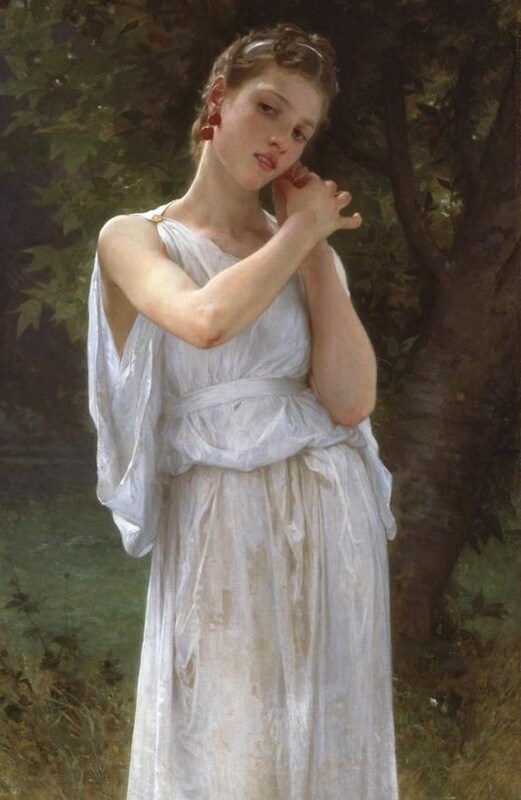 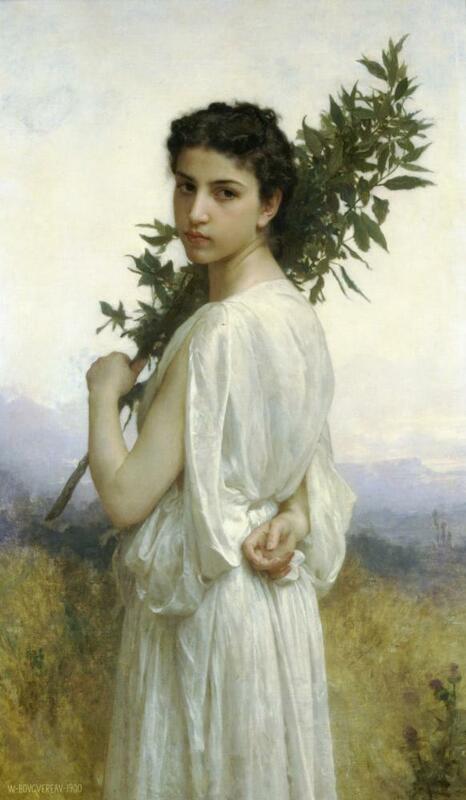 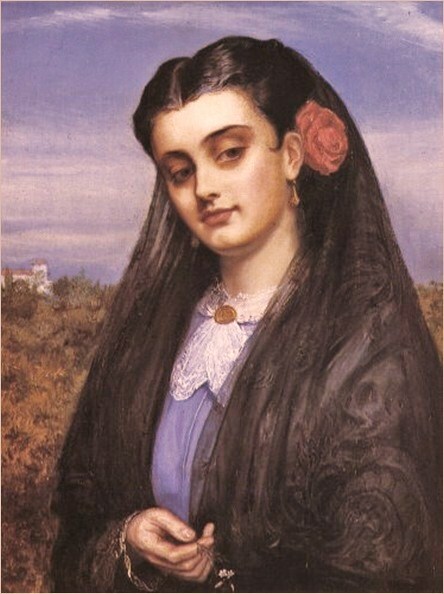 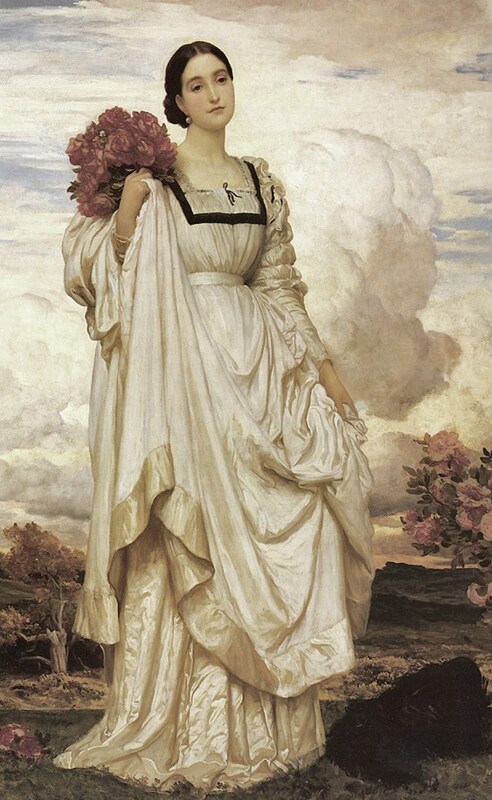 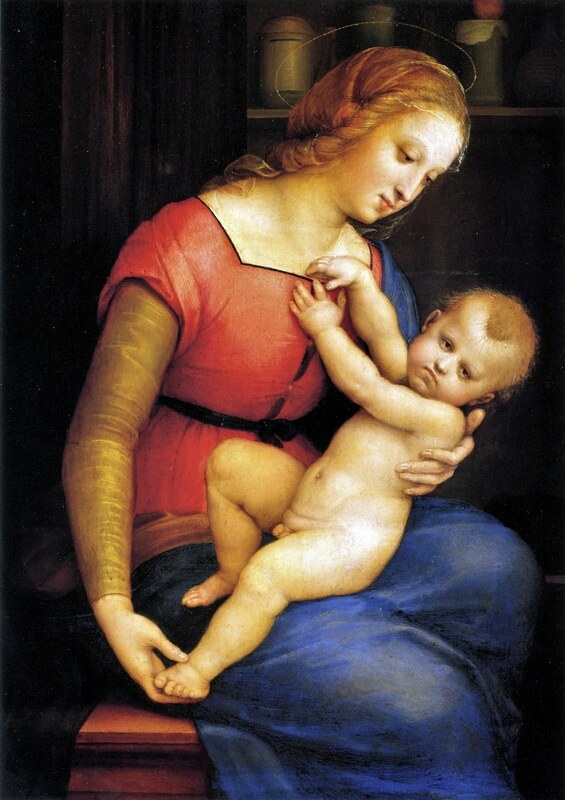 While in Europe, she also trained in Munich & copied old-master paintings in Italy, England, & Spain. 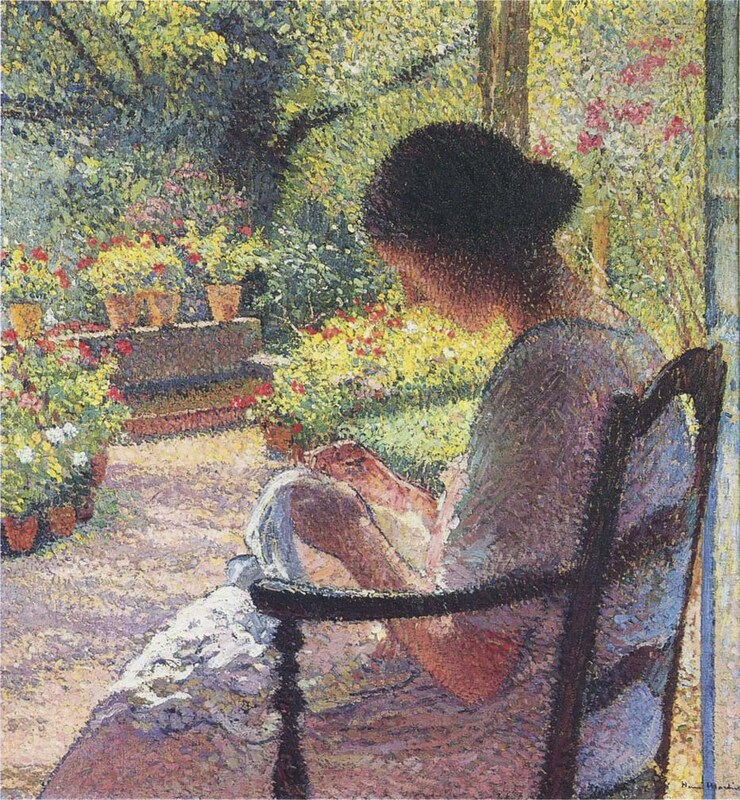 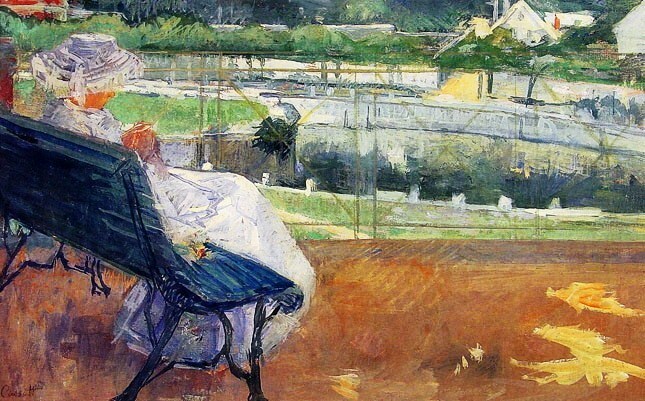 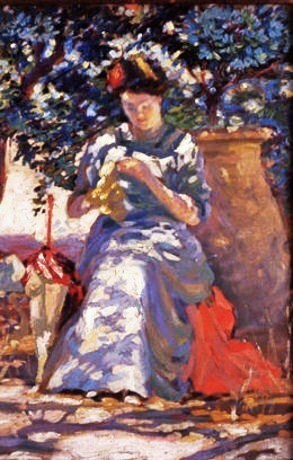 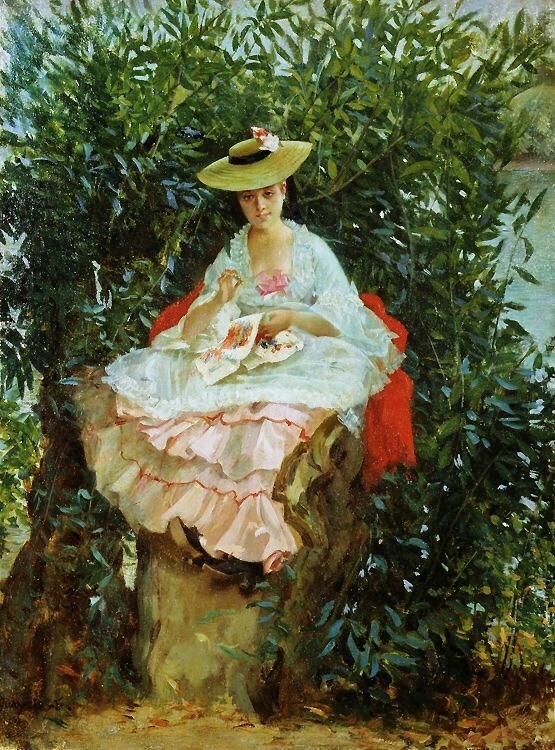 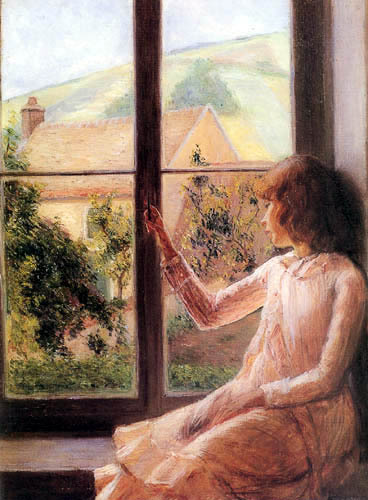 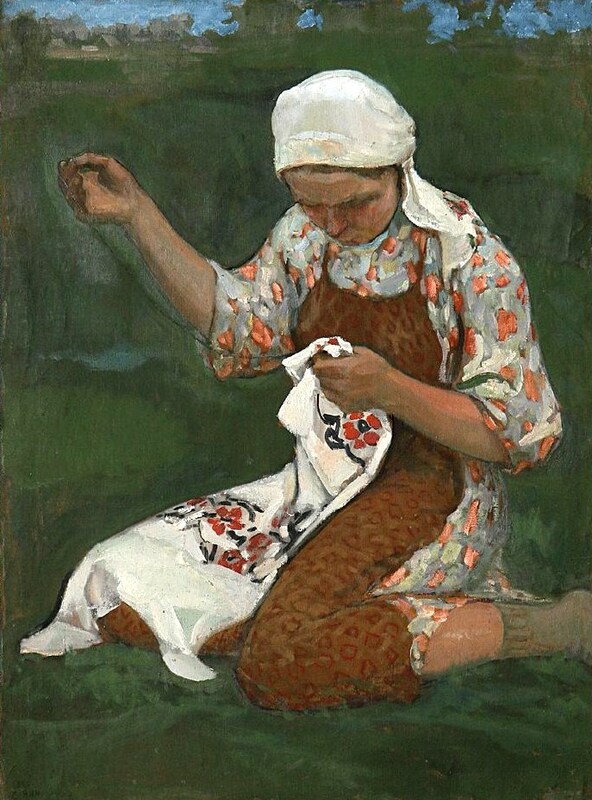 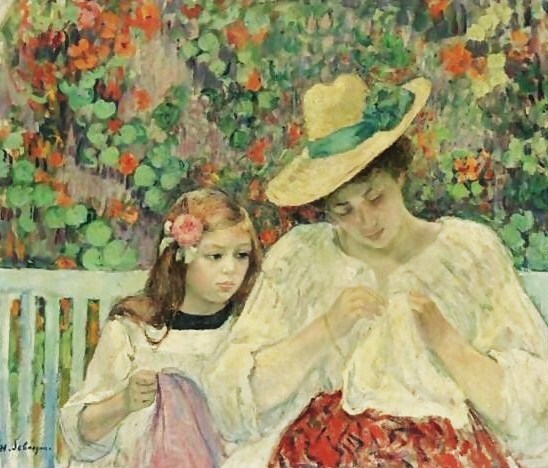 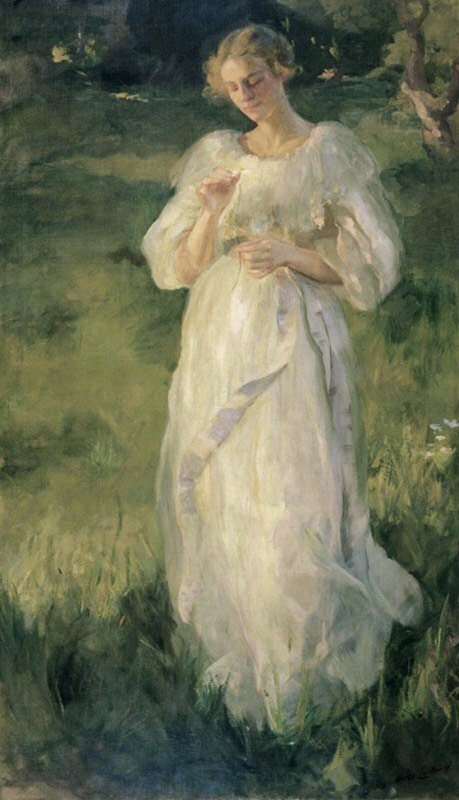 When she was 41 years old, Perry saw her first impressionist painting in a Paris gallery. 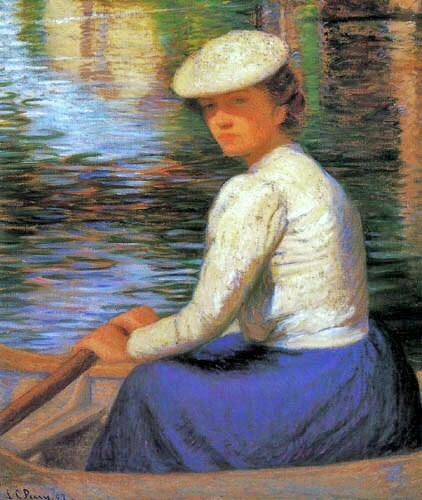 Perry sought out the artist, Monet, & became his close friend. 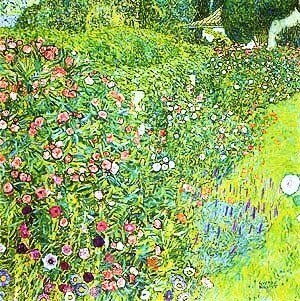 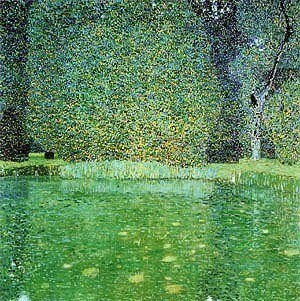 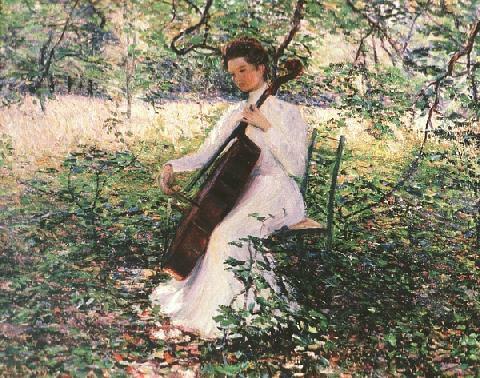 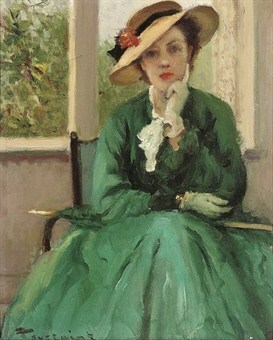 For 9 summers the Perrys rented a house at Giverny, near Monet’s; and he often advised Perry on her art. 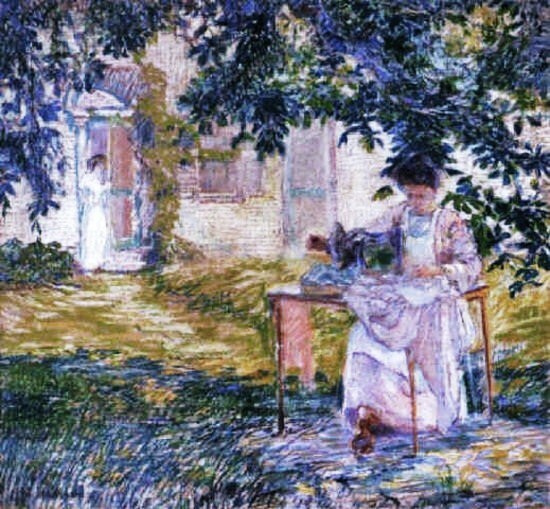 Between 1898 & 1901, the family resided in Japan, where Thomas Perry taught & Lilla studied some of the sources of impressionism – Japanese fabrics & prints. 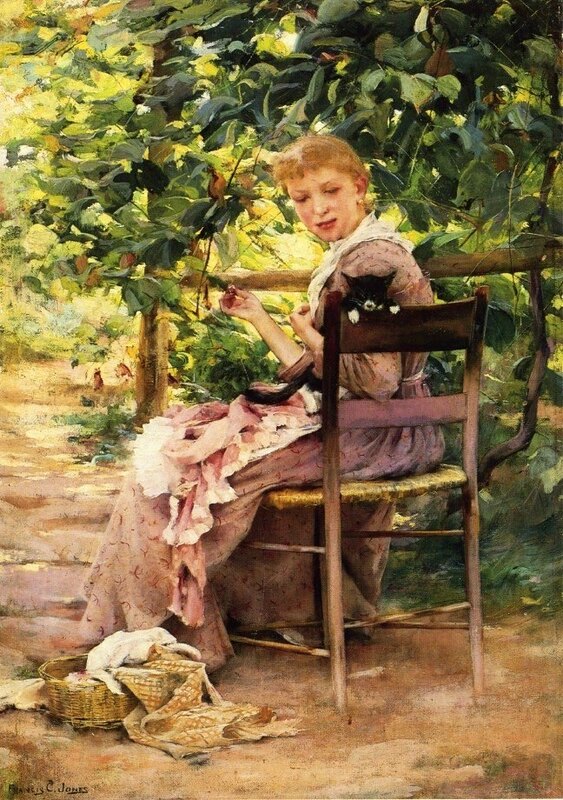 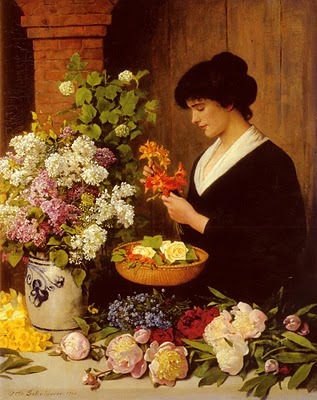 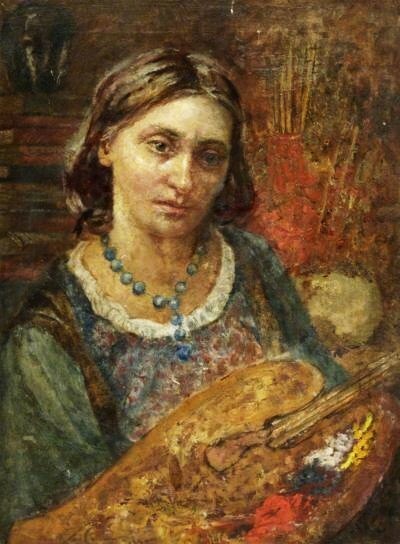 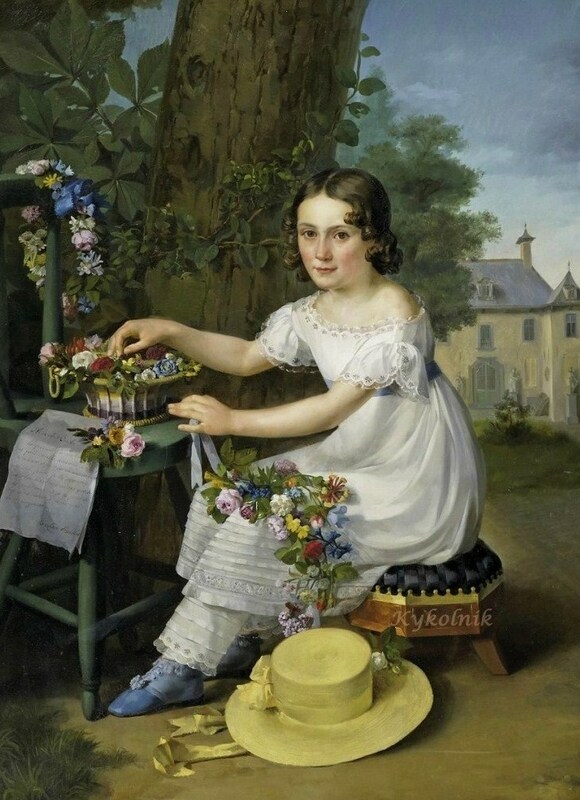 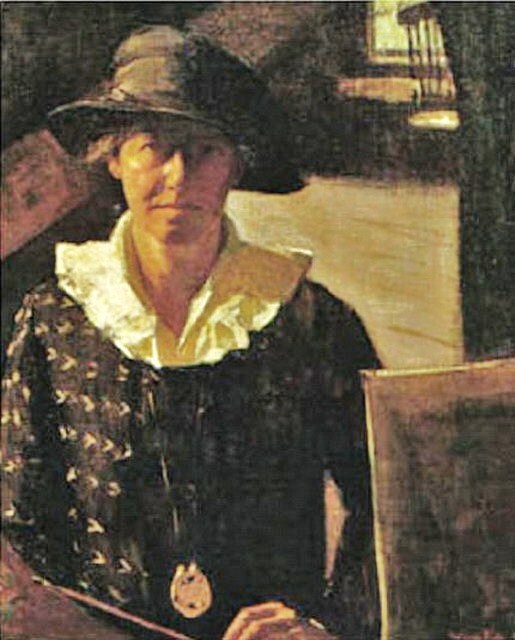 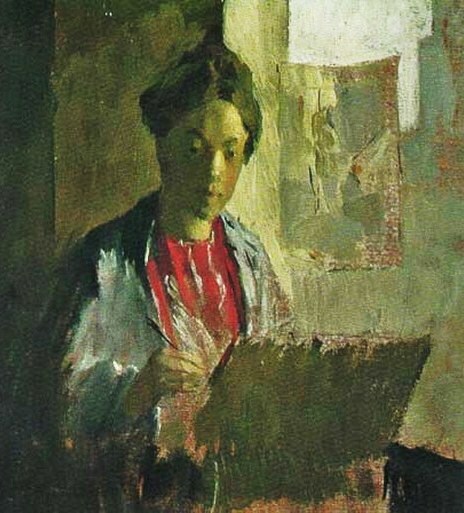 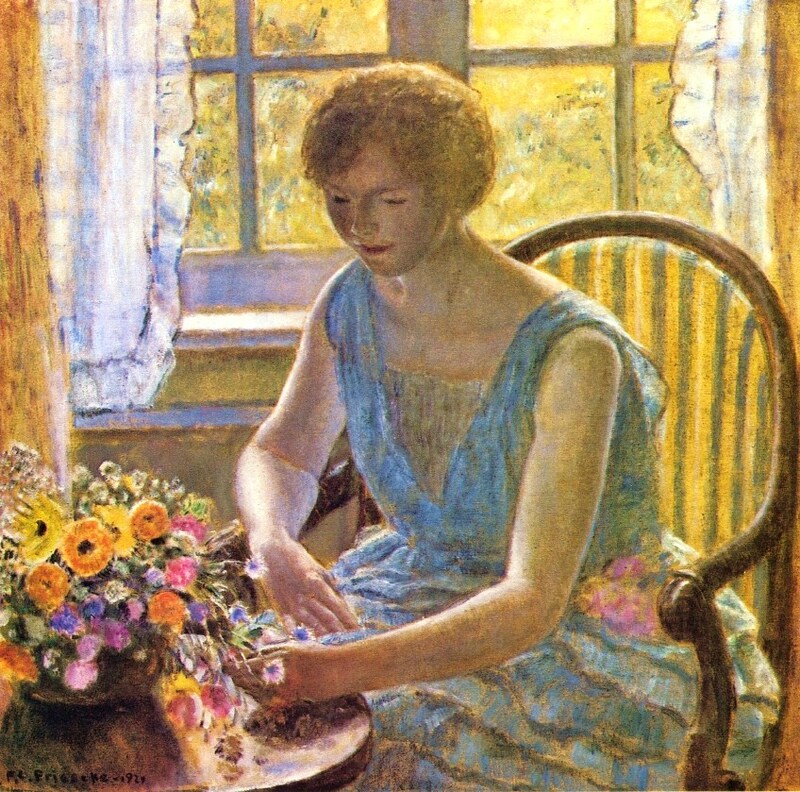 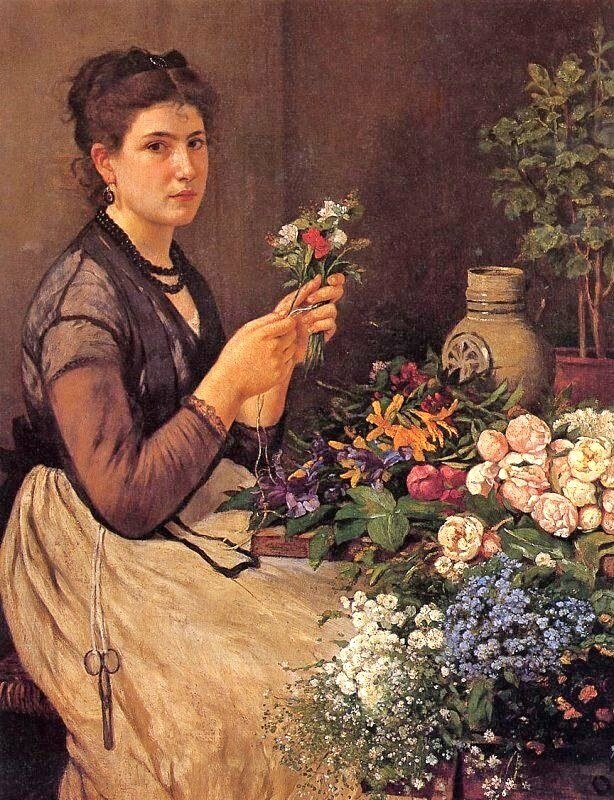 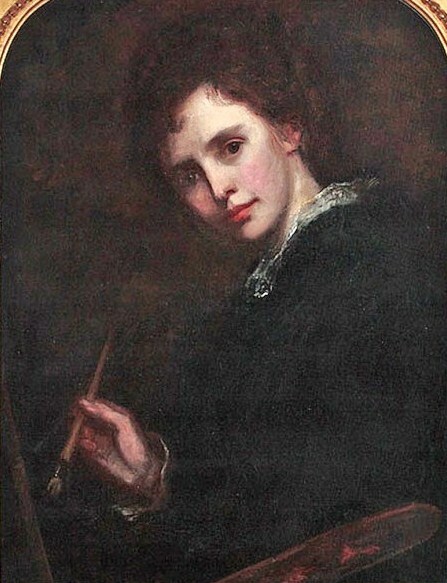 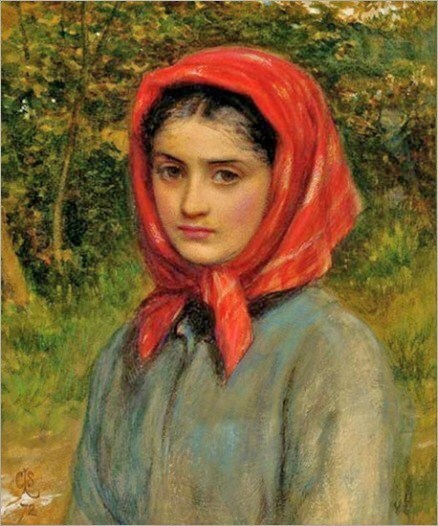 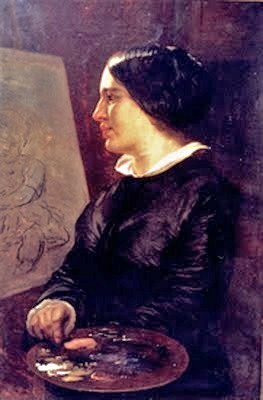 There she produced some 80 paintings; before returning home to paint in Boston during the academic year & on a New Hampshire farm during the summers. 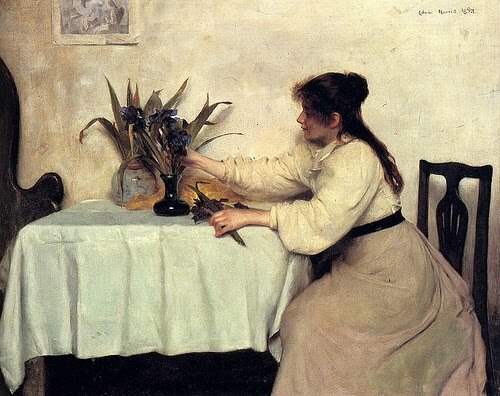 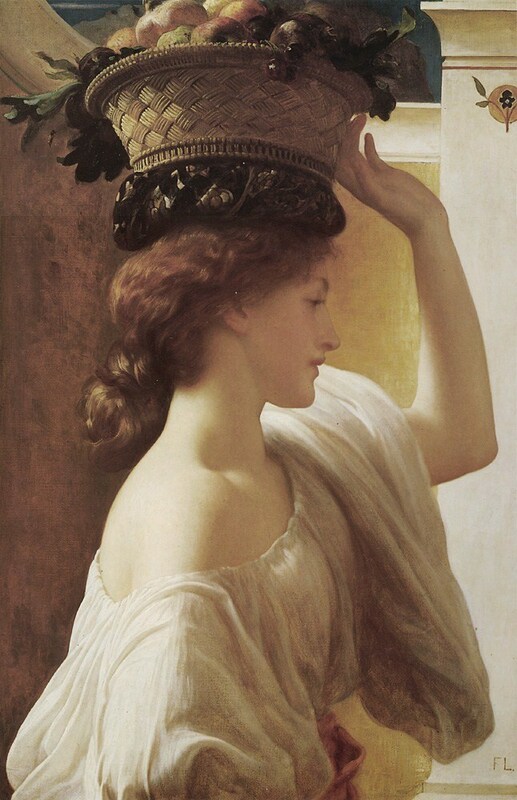 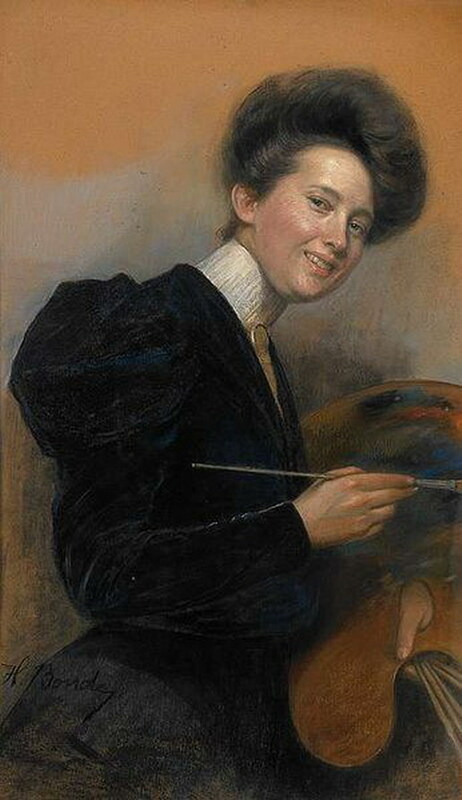 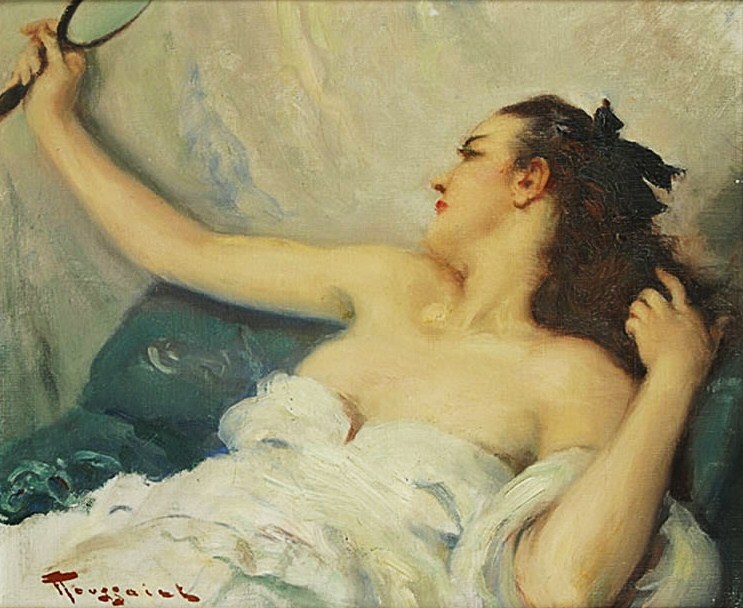 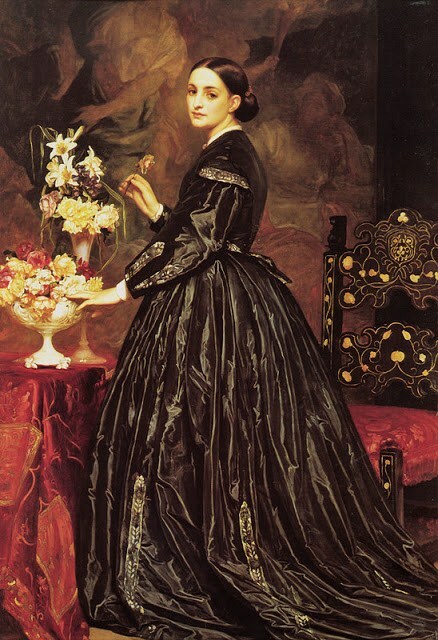 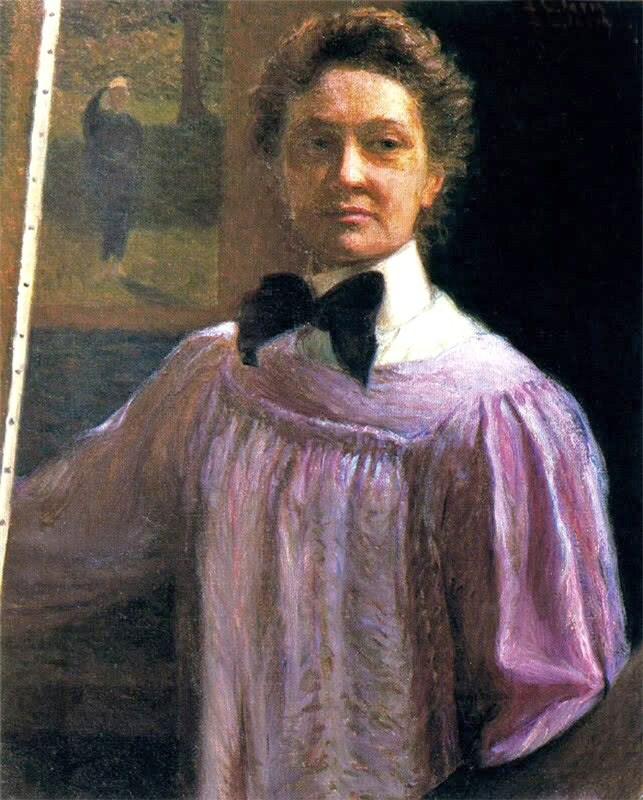 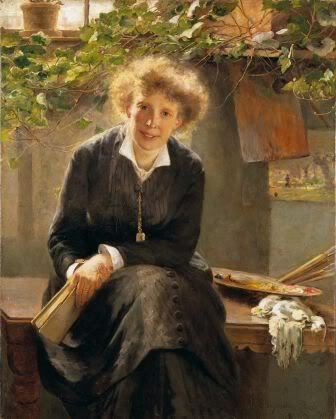 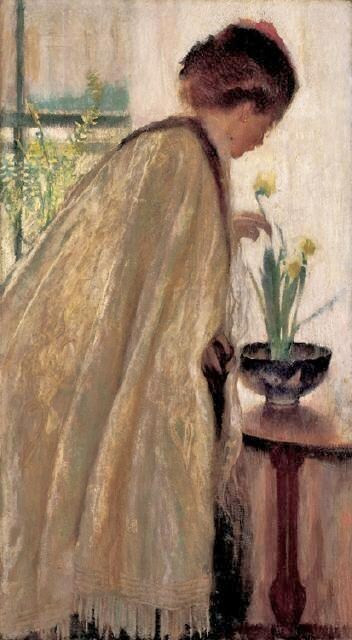 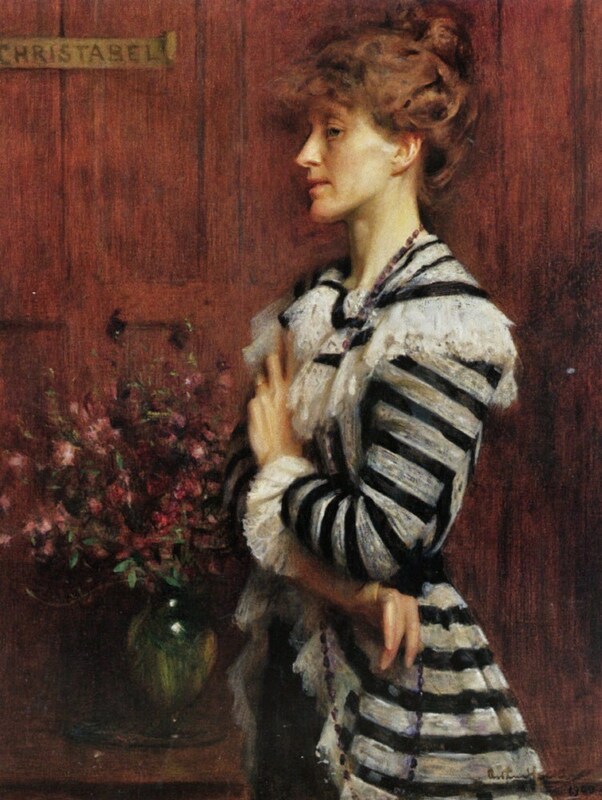 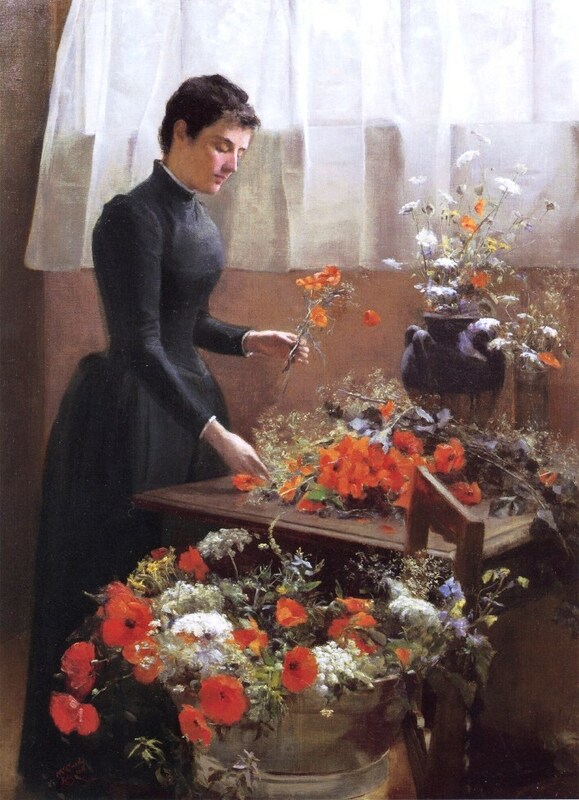 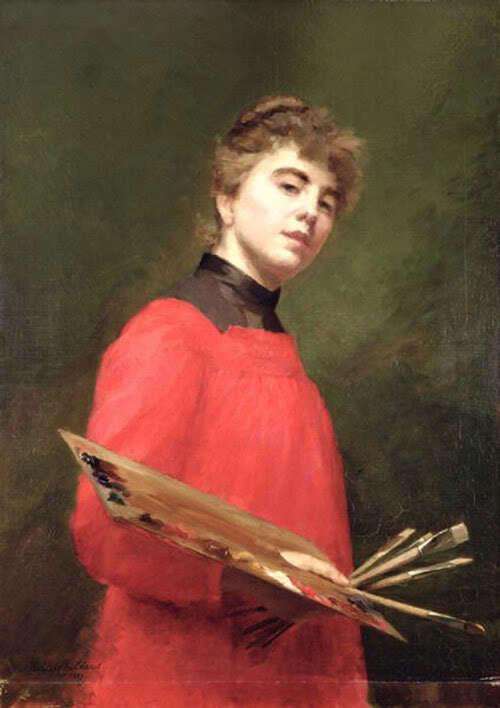 Perry exhibited her work at the Paris Salon & the 1893 World’s Columbian Exposition in Chicago. 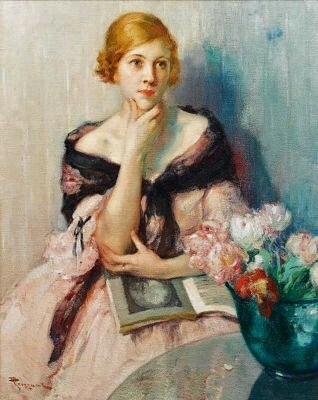 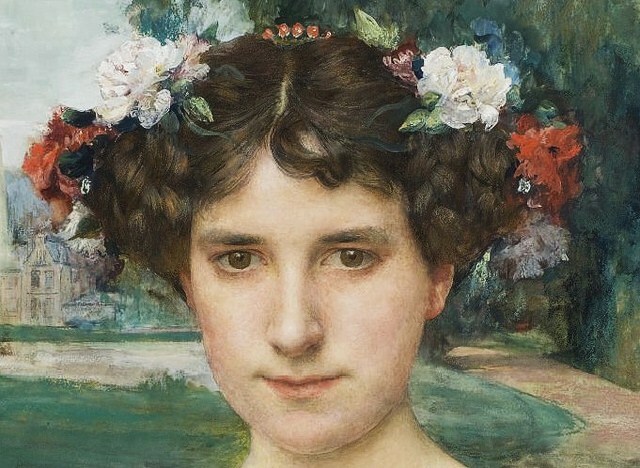 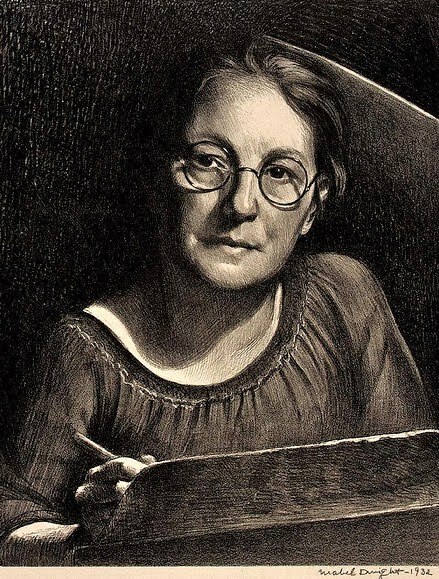 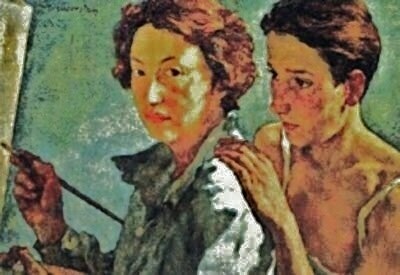 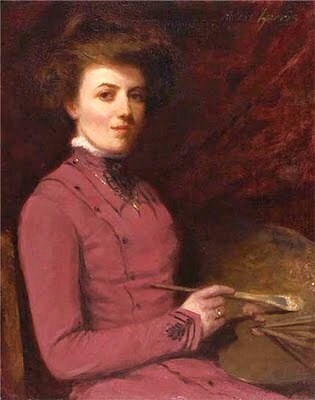 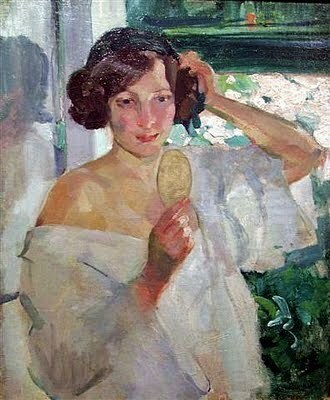 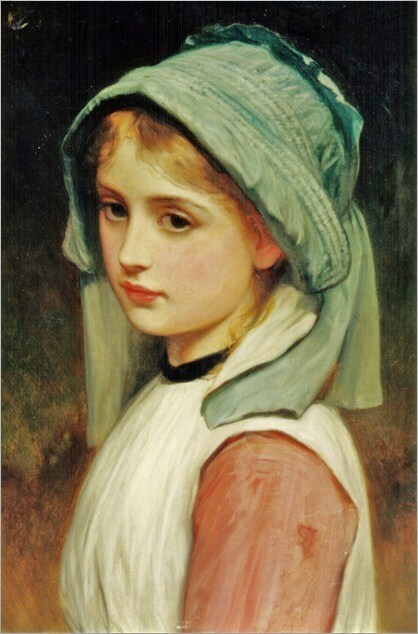 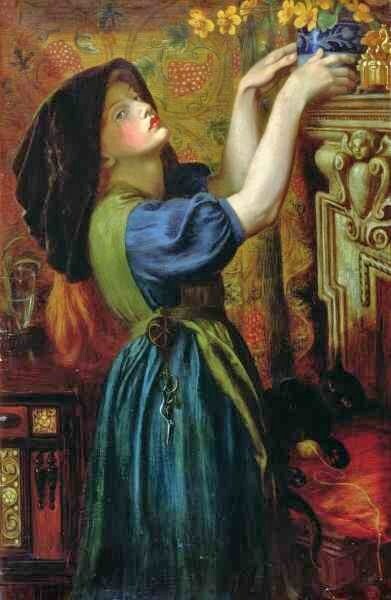 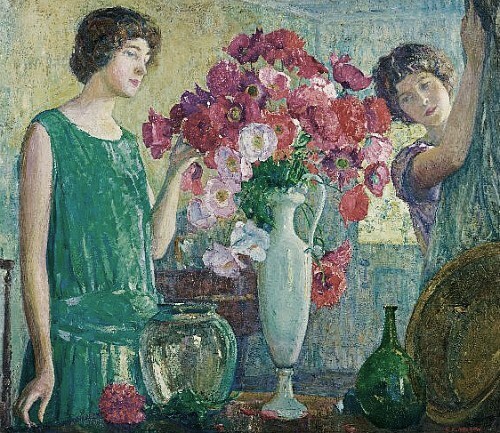 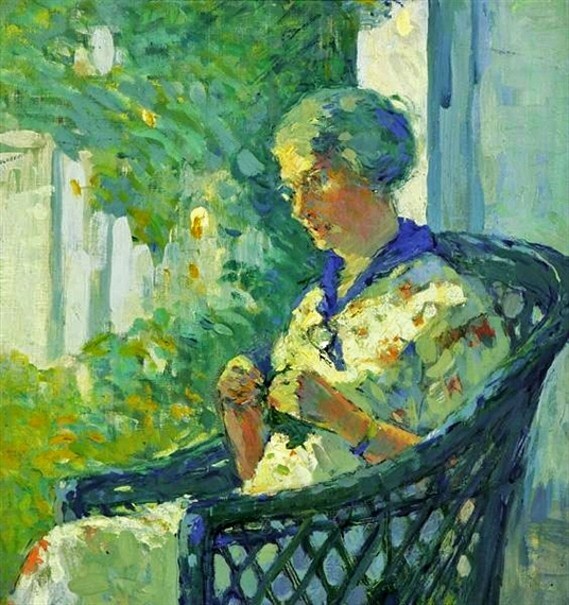 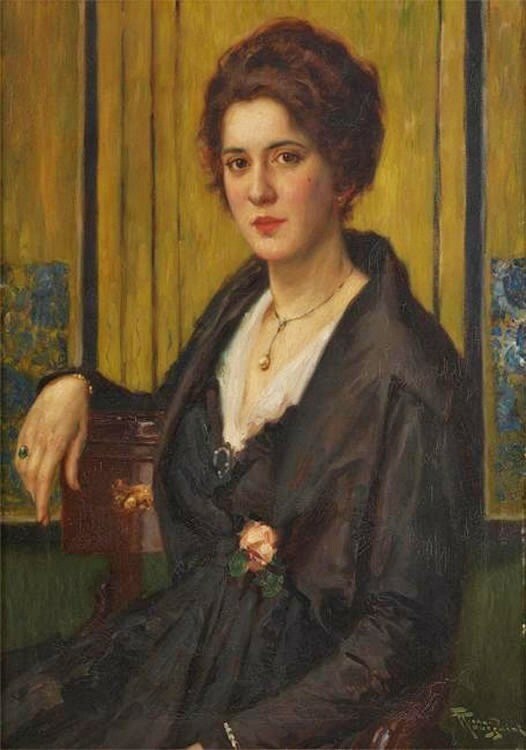 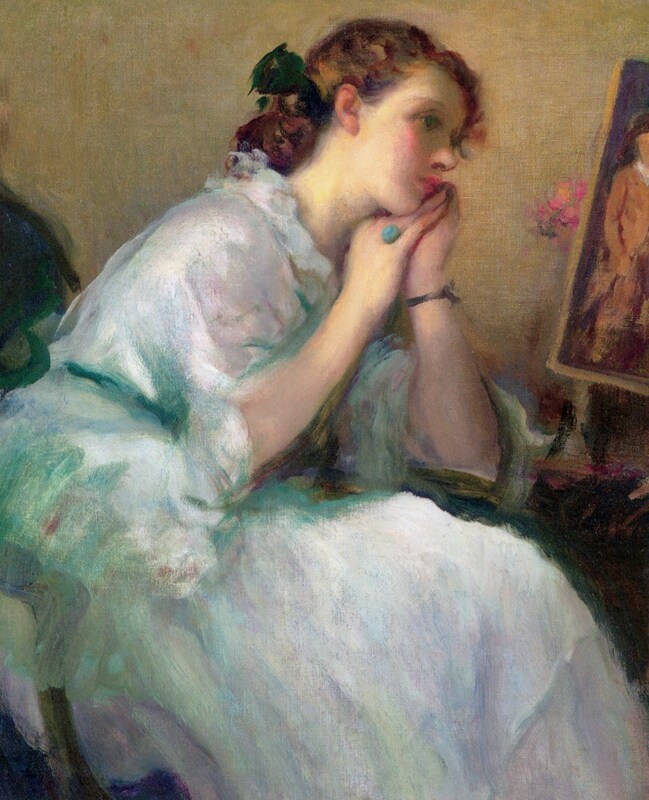 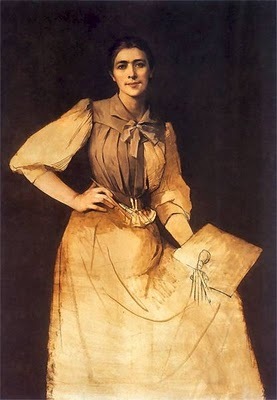 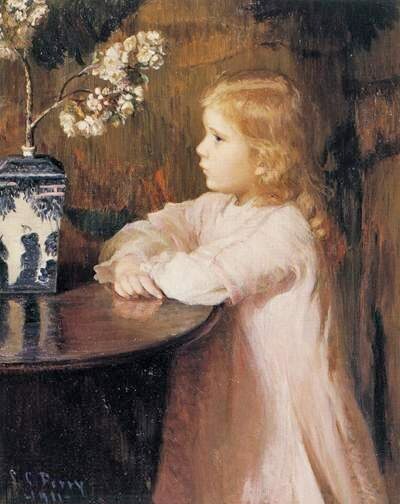 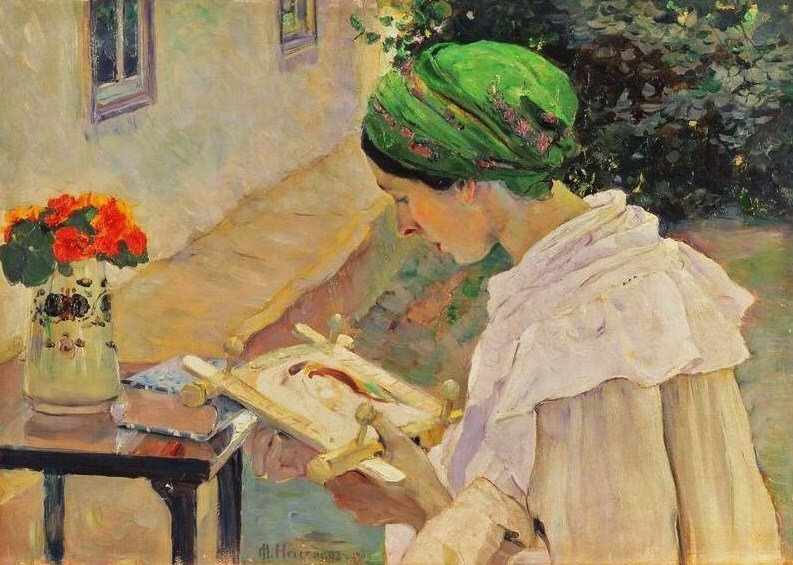 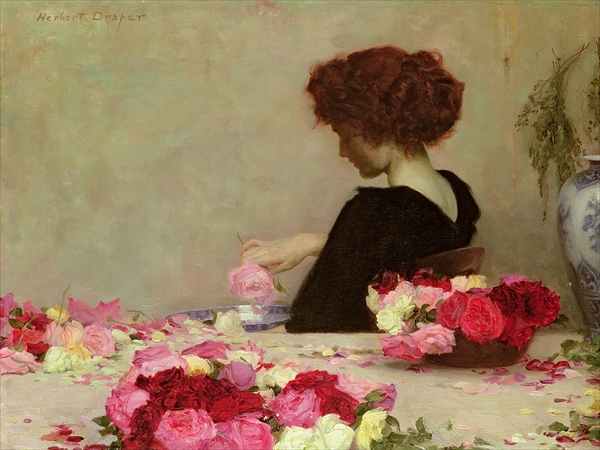 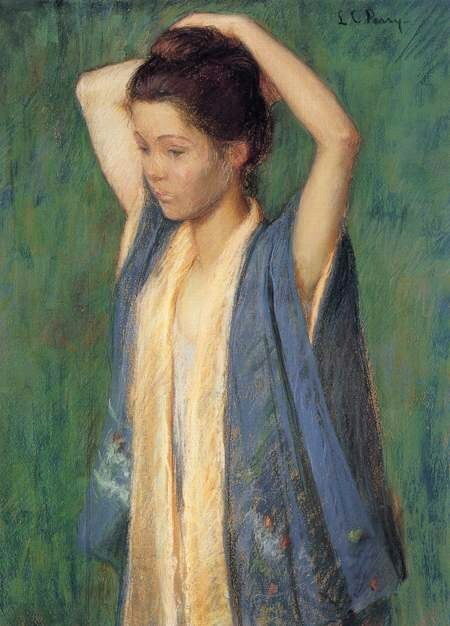 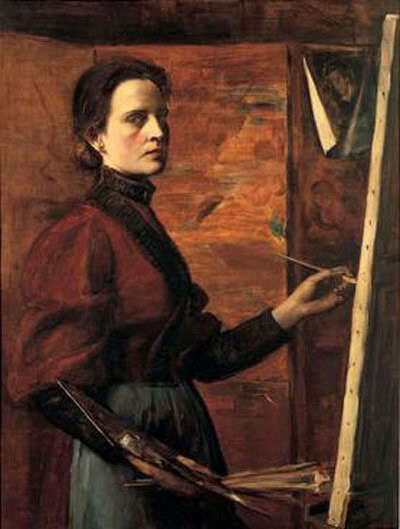 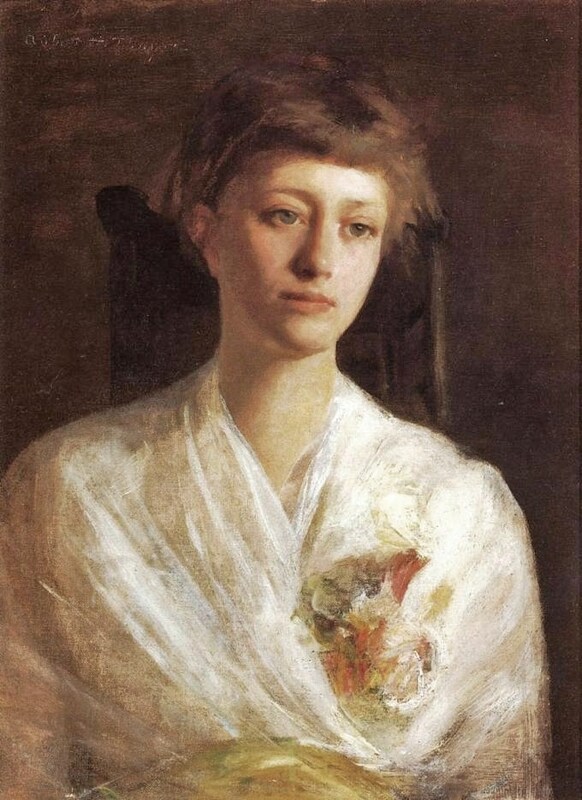 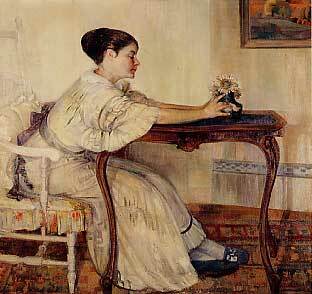 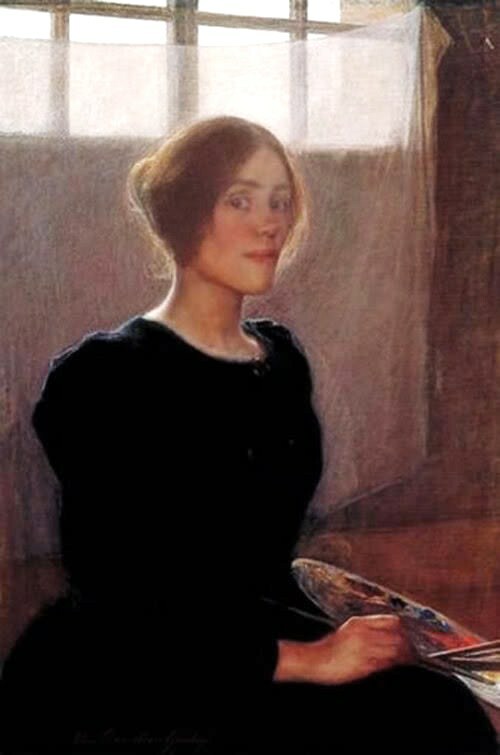 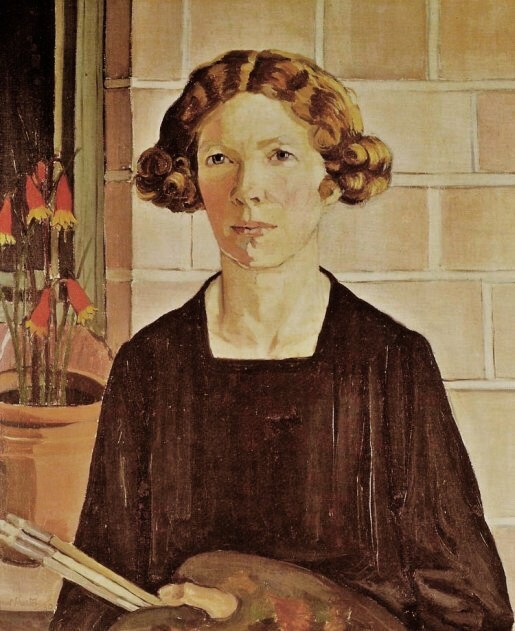 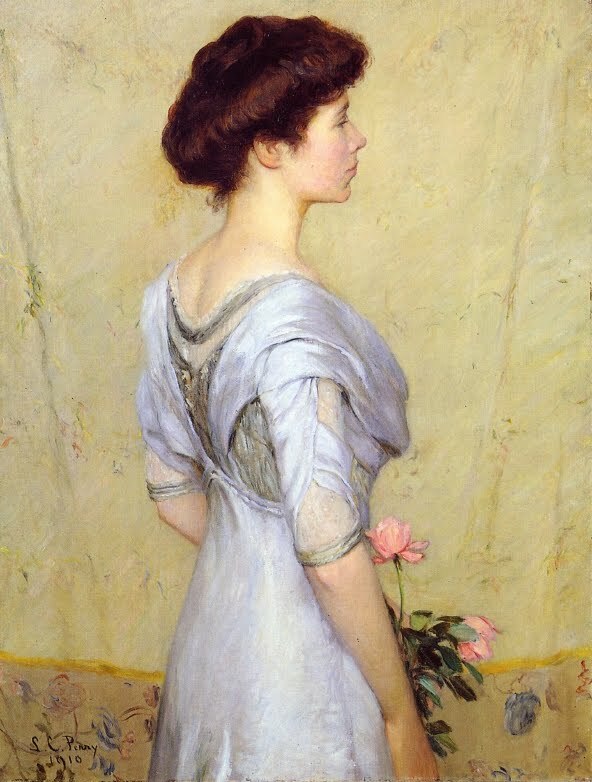 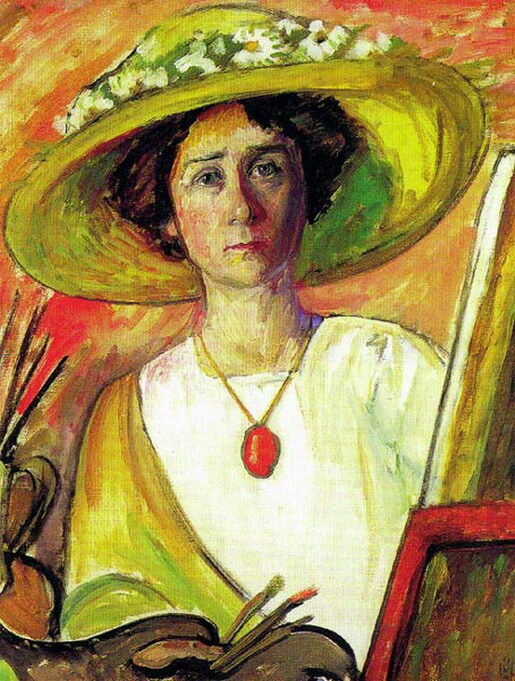 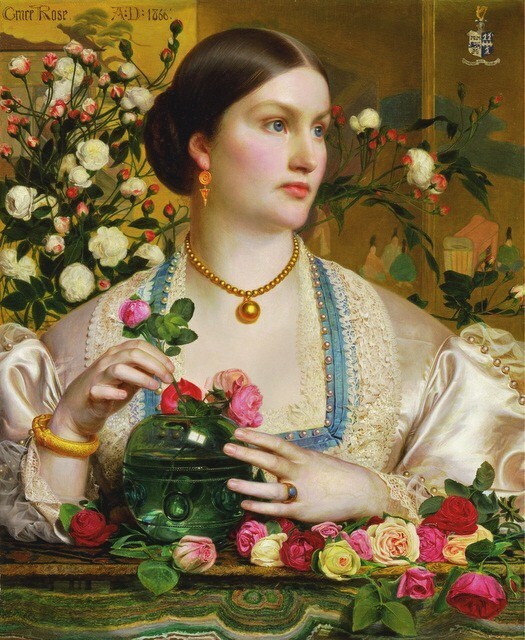 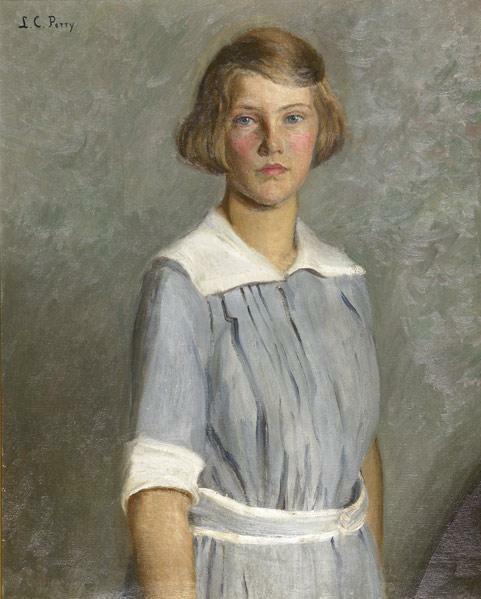 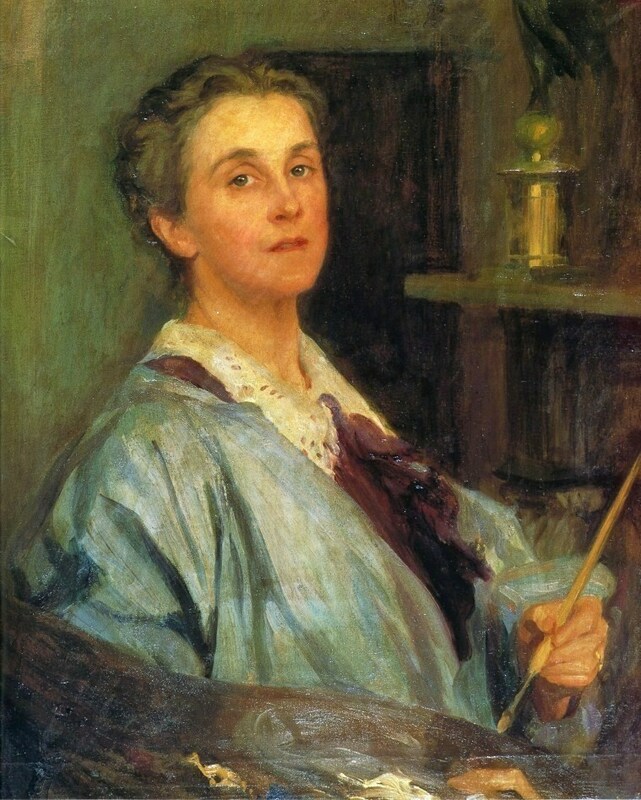 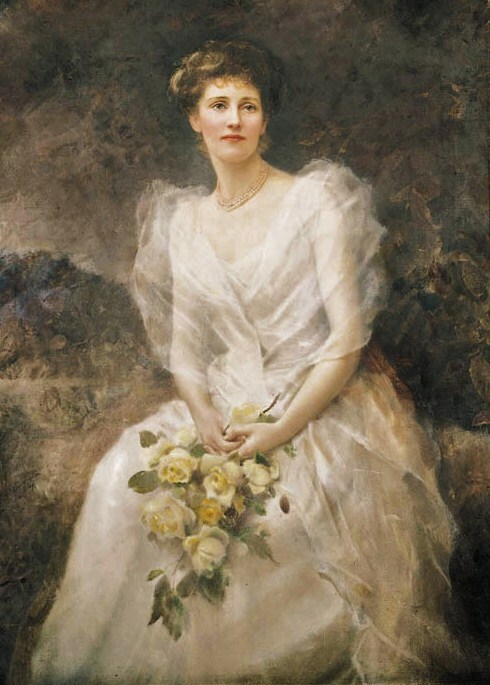 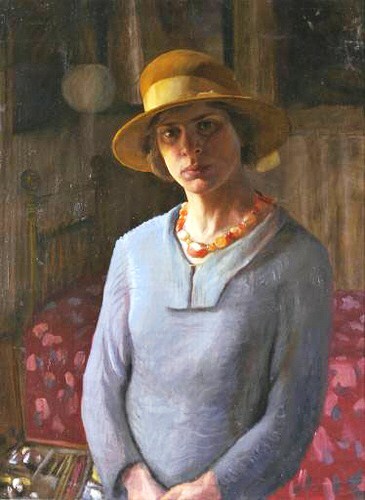 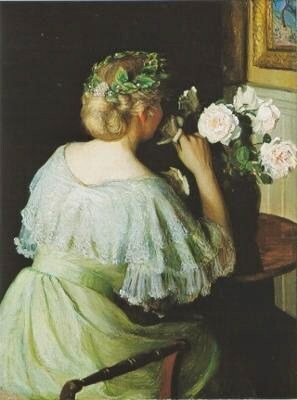 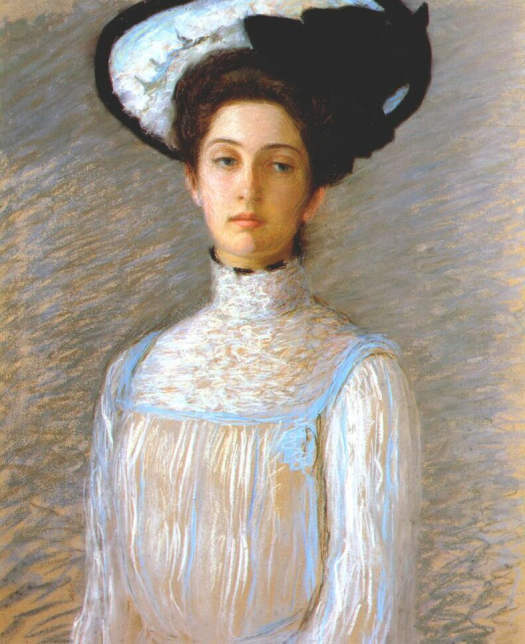 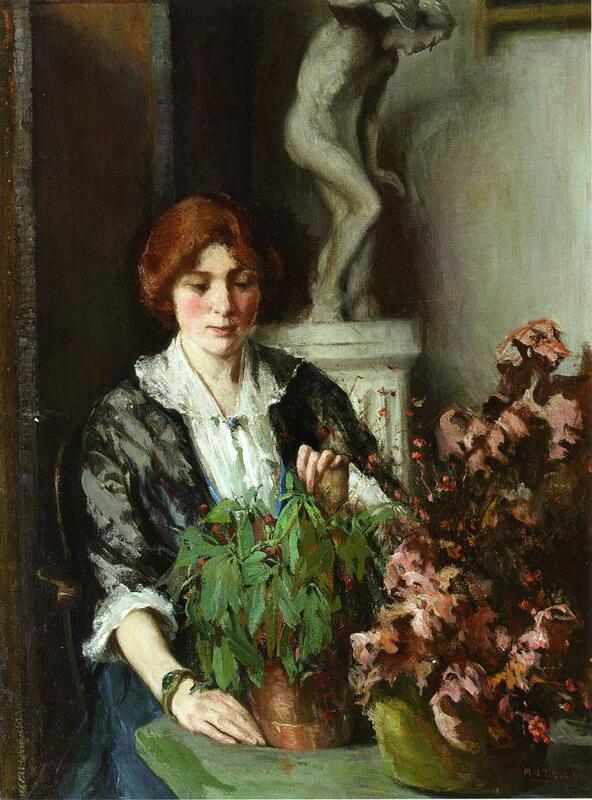 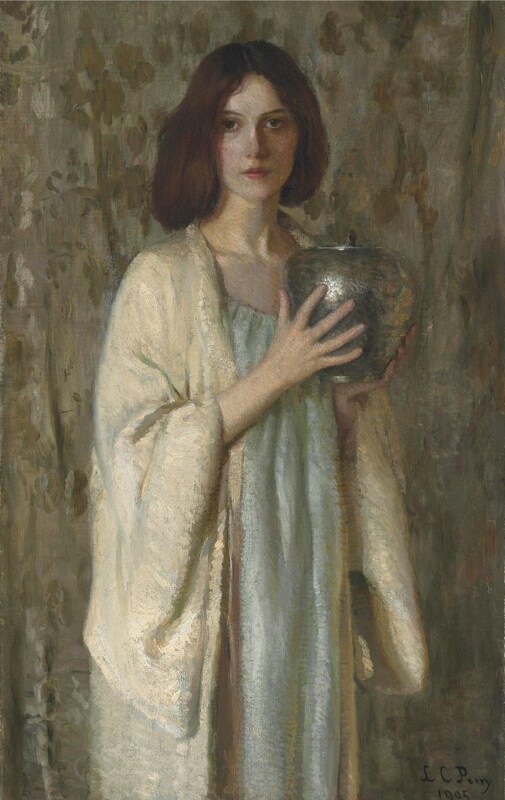 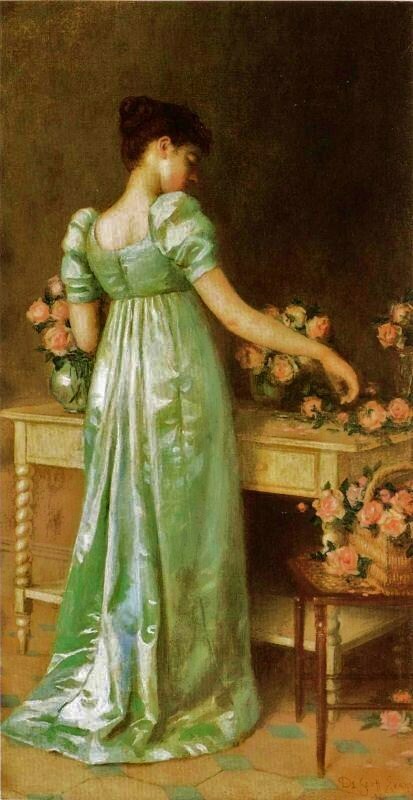 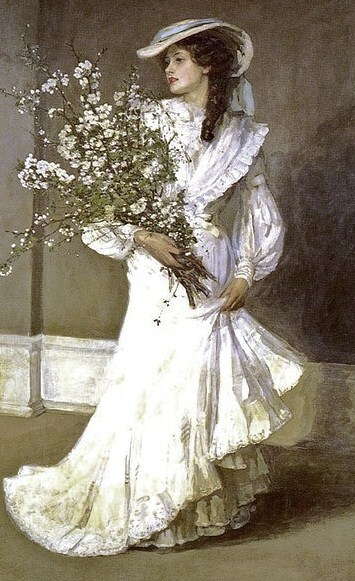 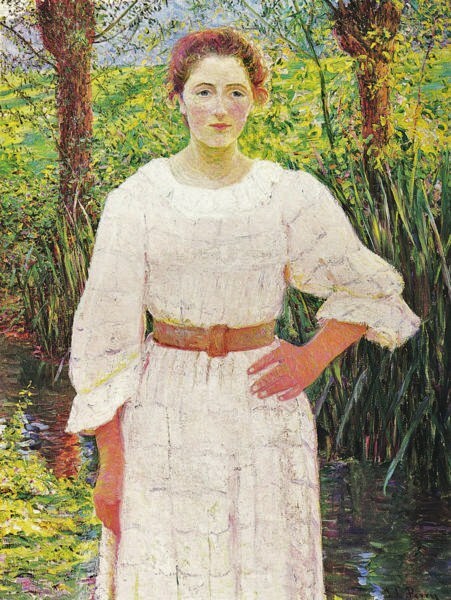 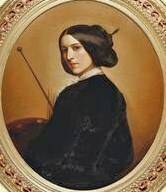 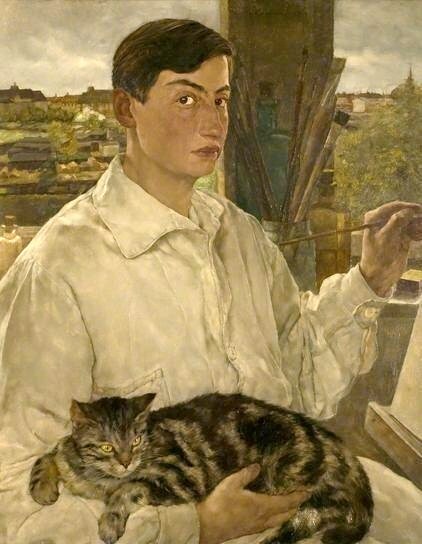 She won medals for her paintings at important exhibitions in Boston, St. Louis, & San Francisco. 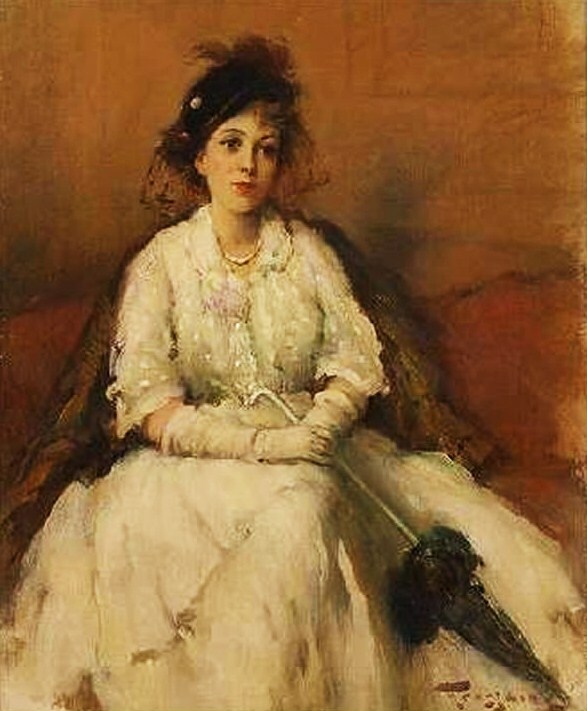 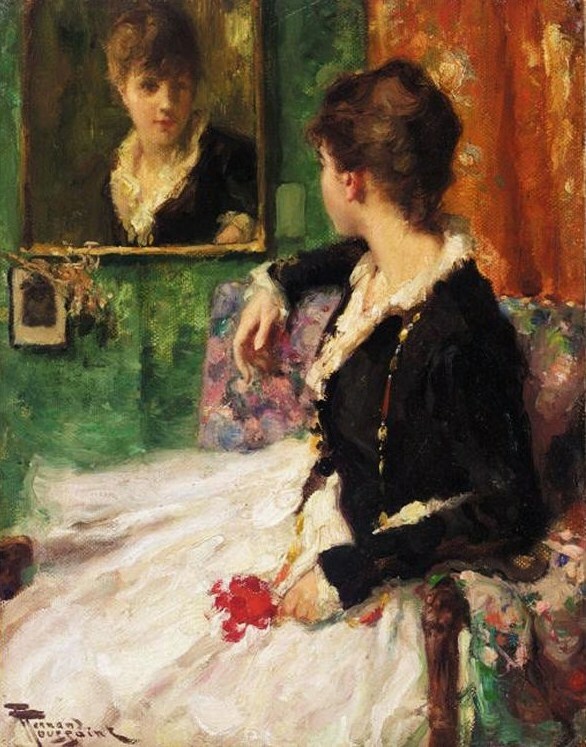 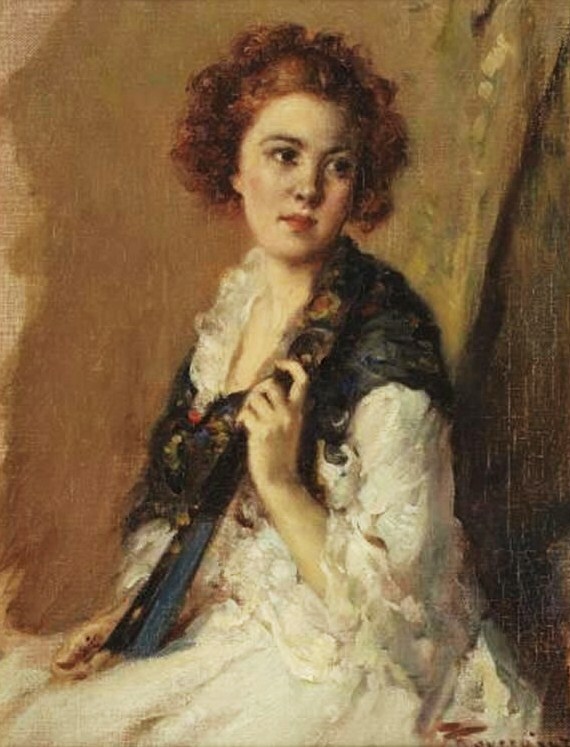 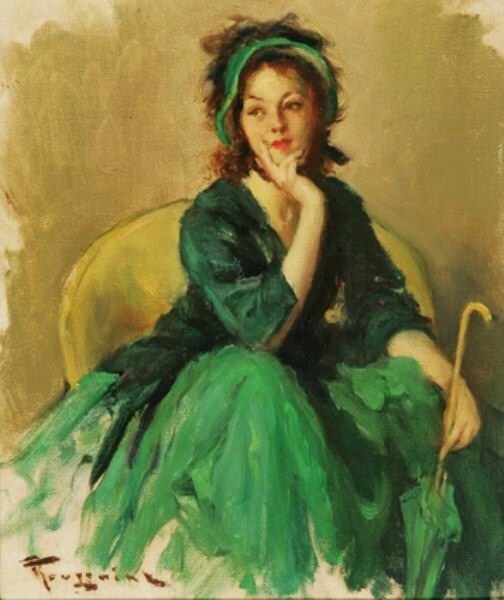 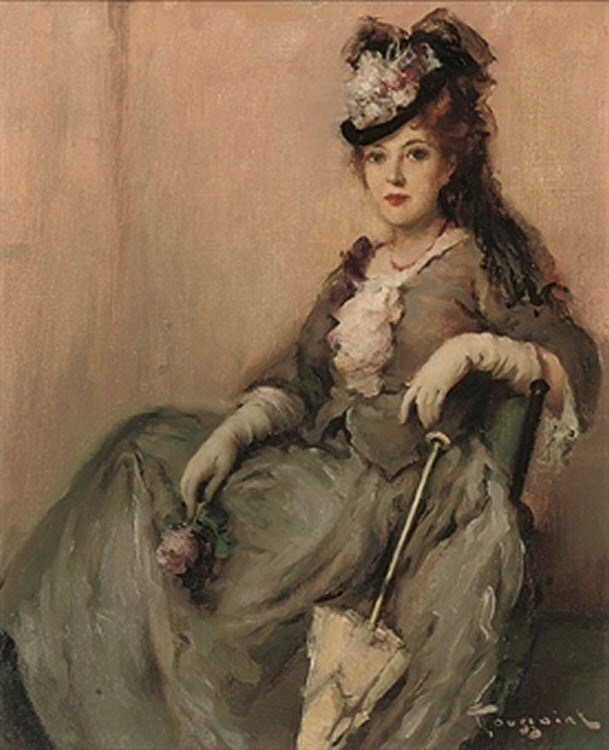 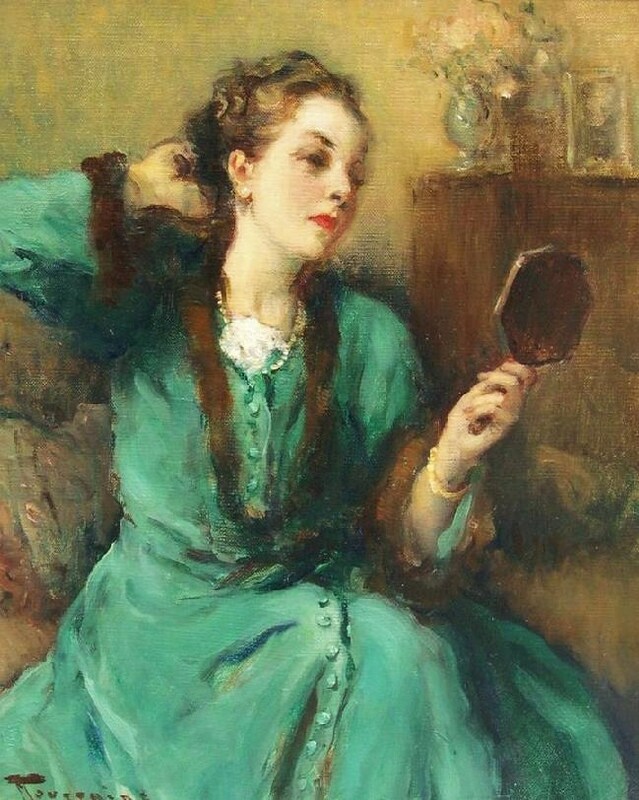 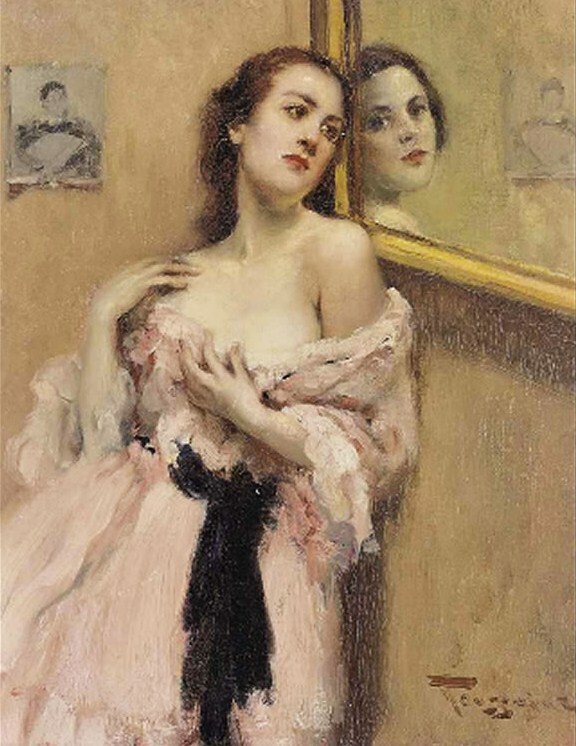 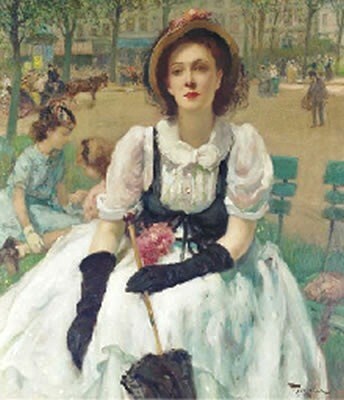 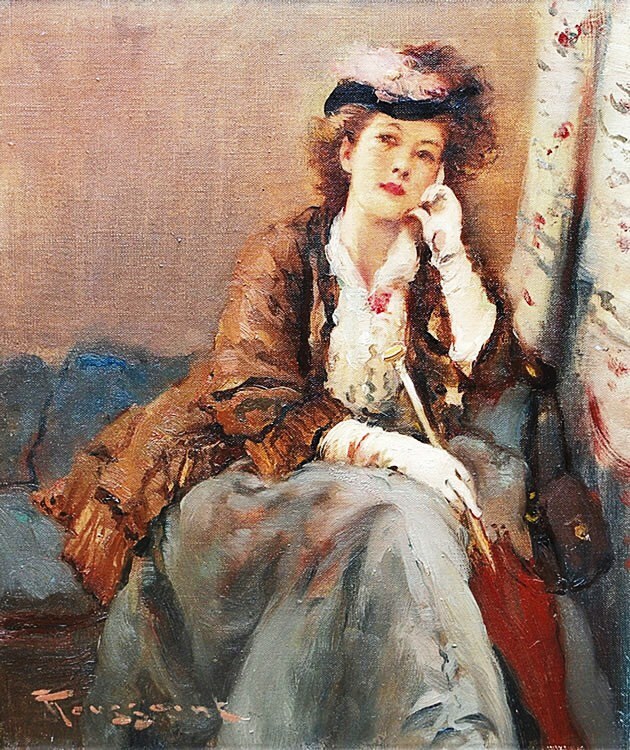 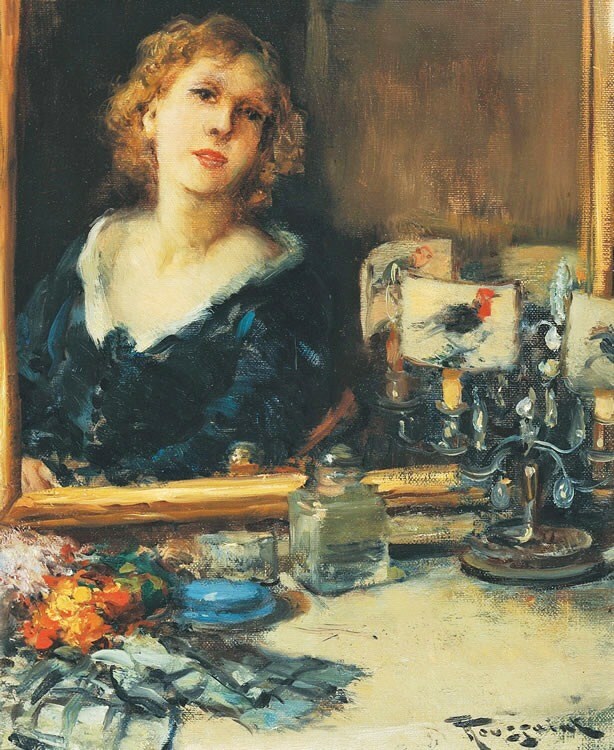 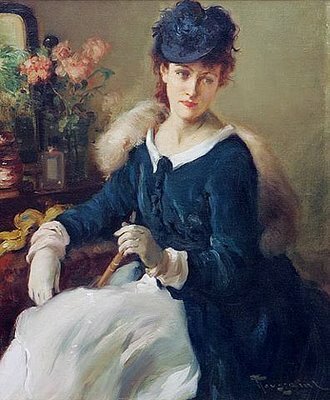 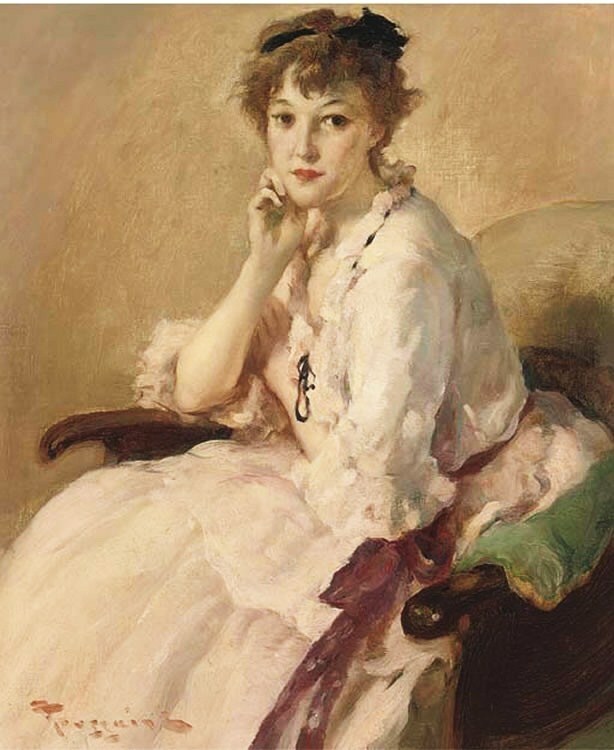 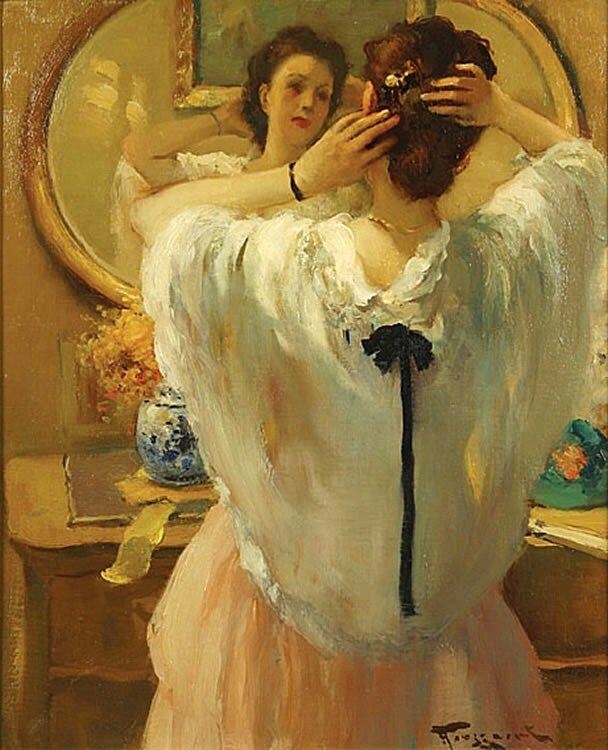 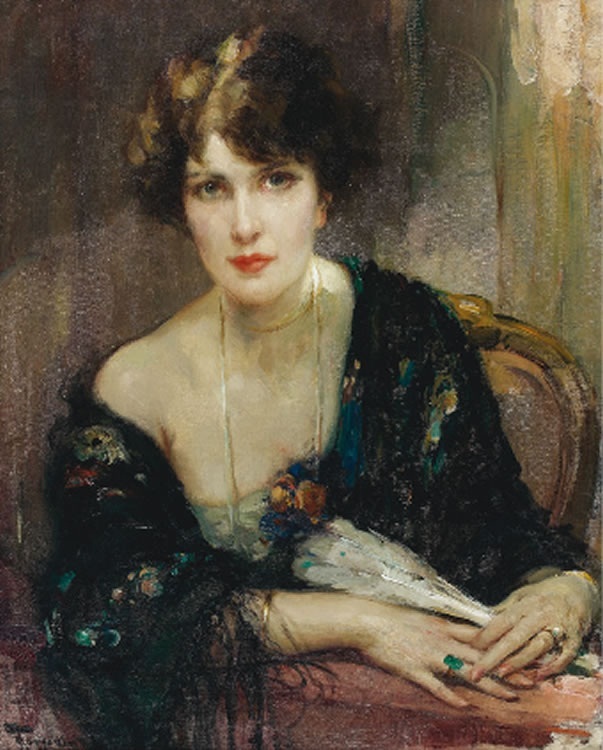 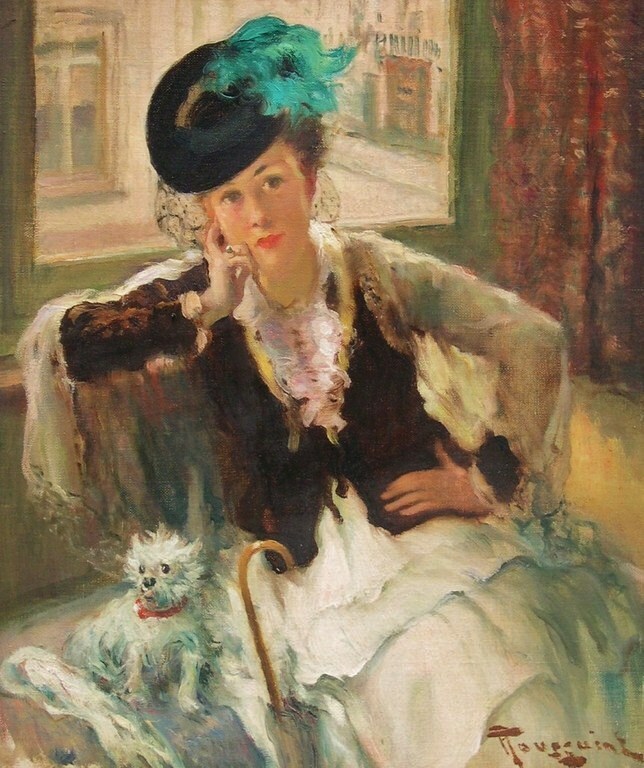 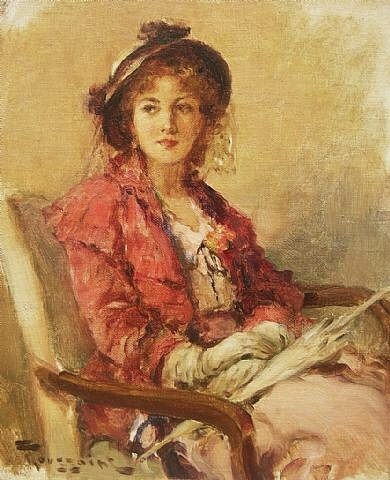 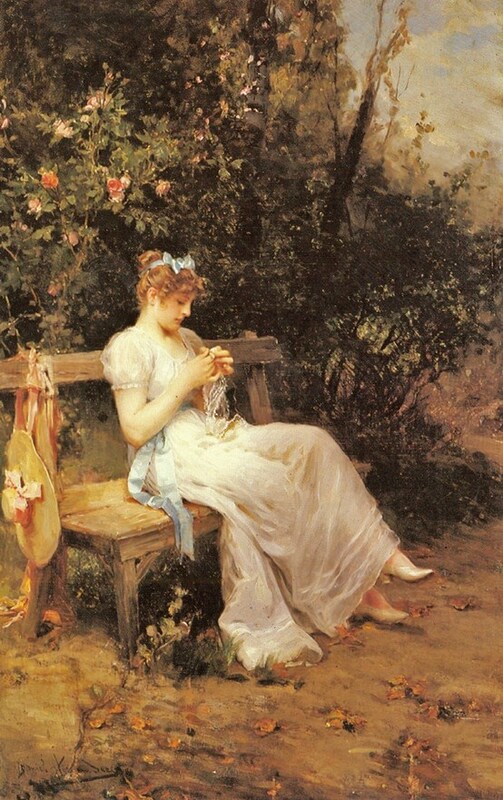 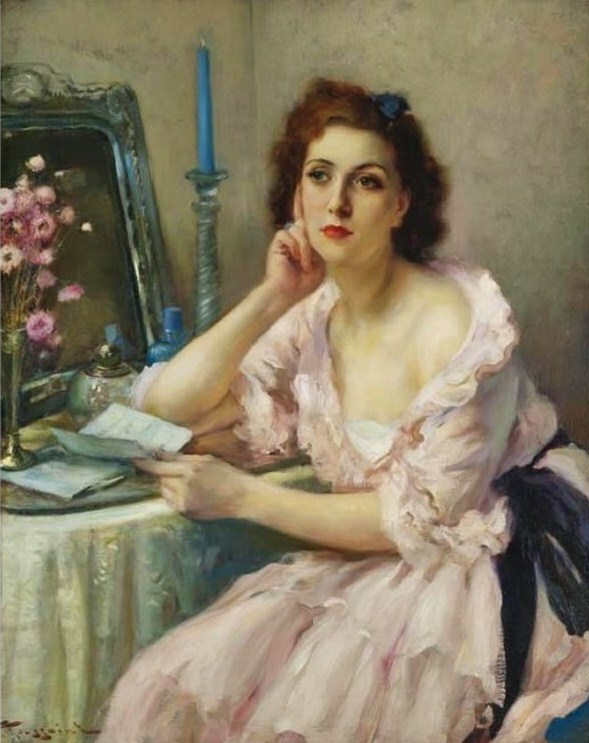 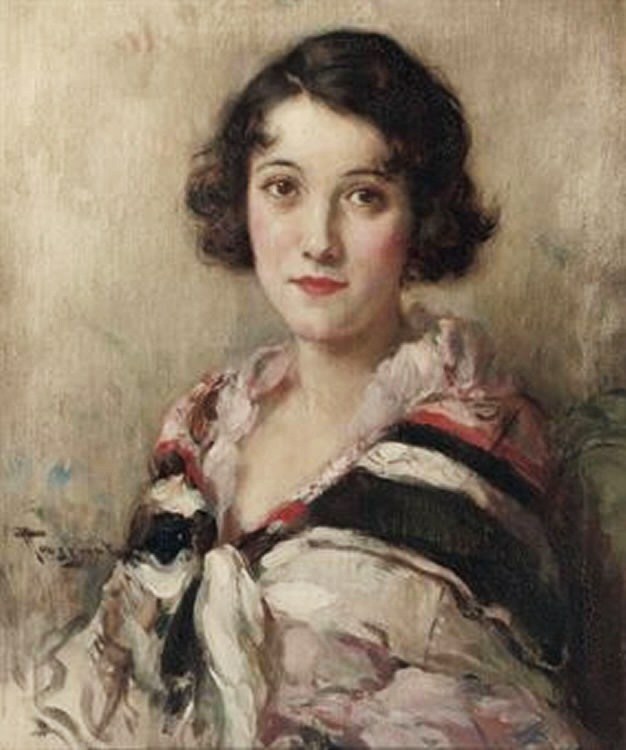 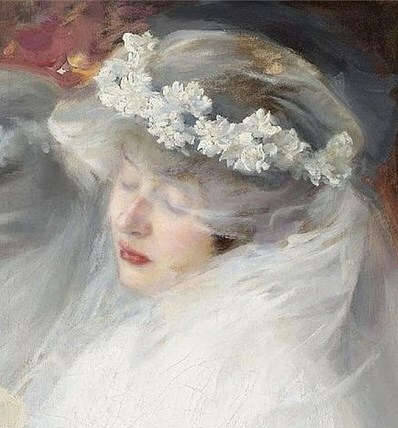 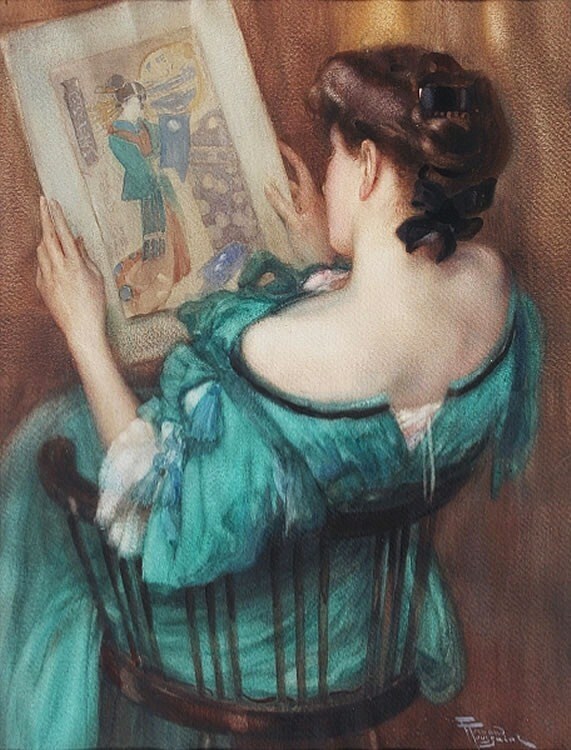 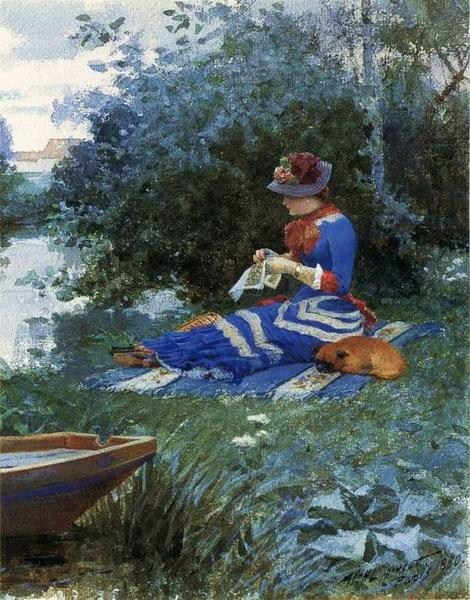 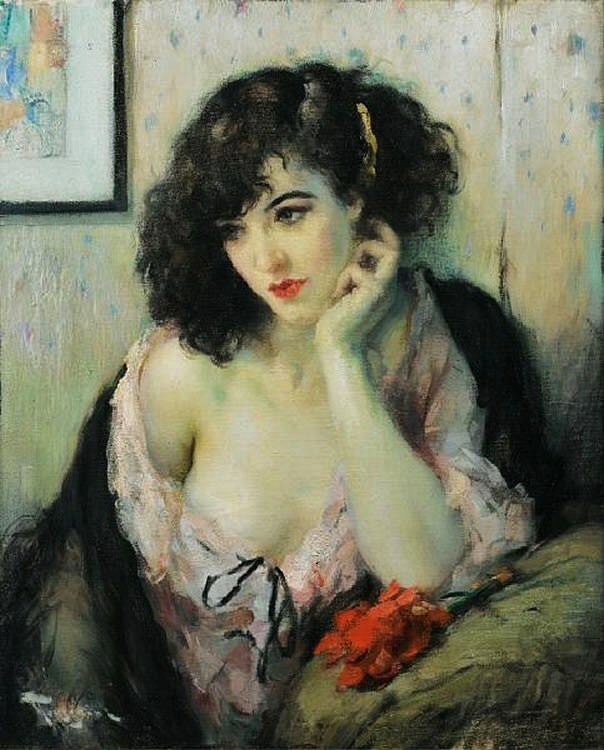 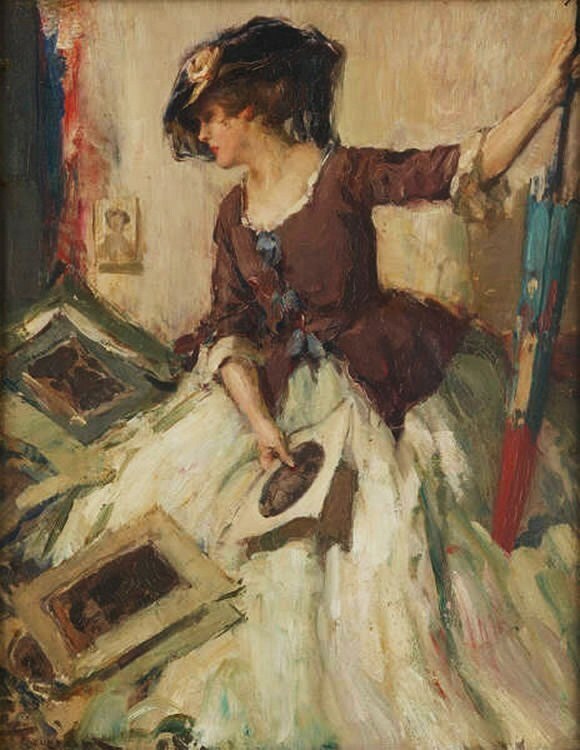 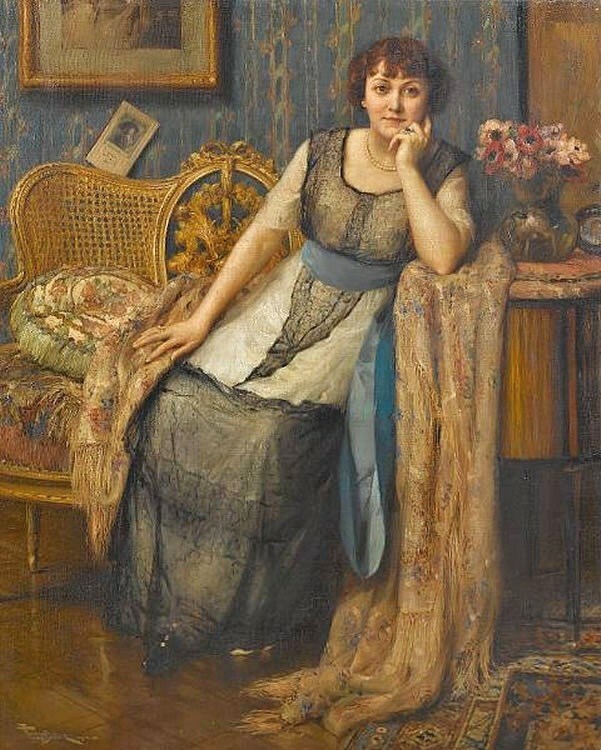 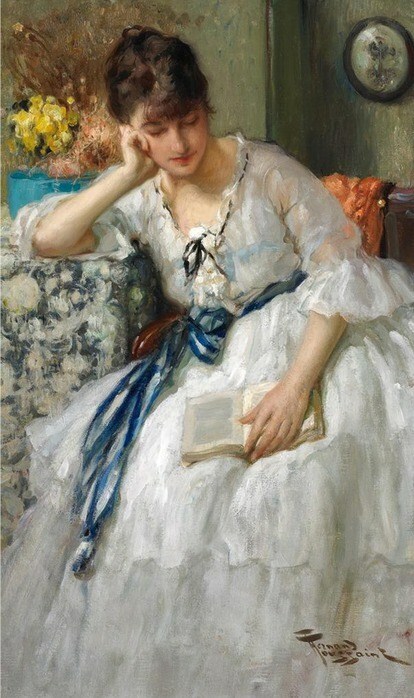 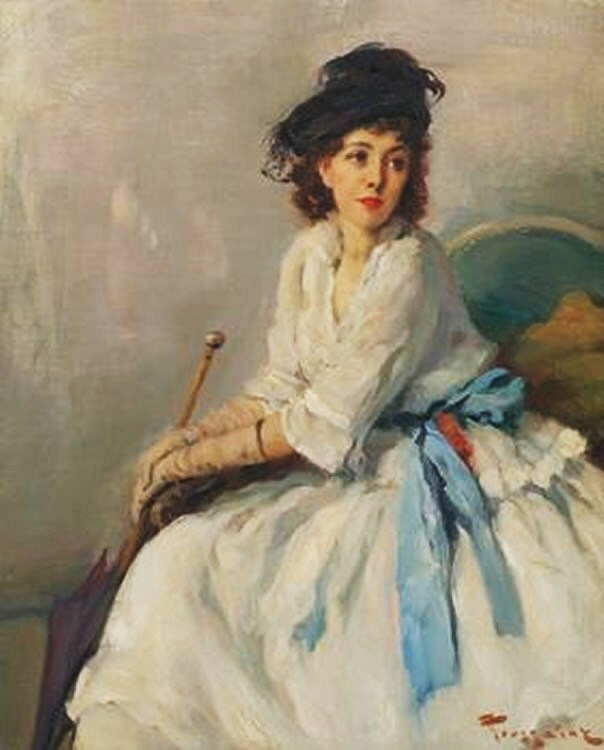 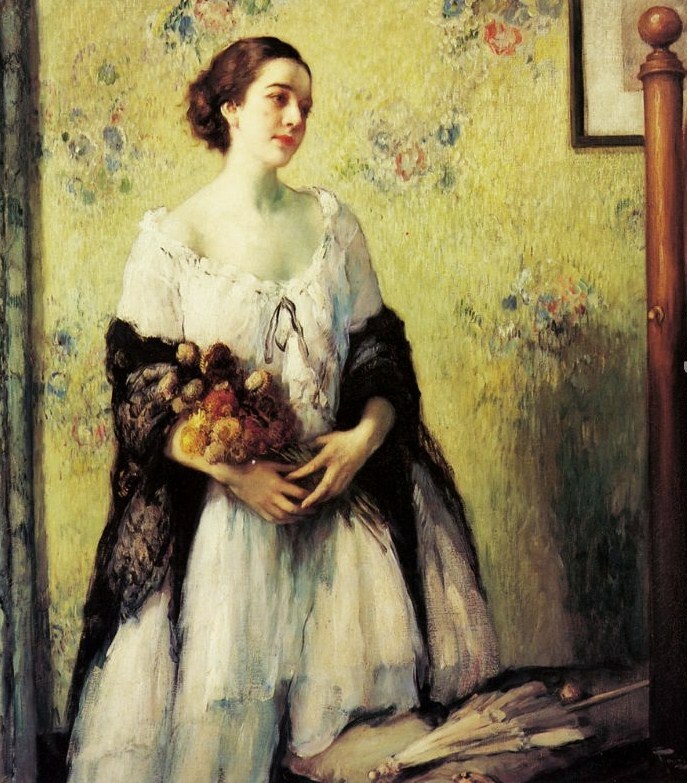 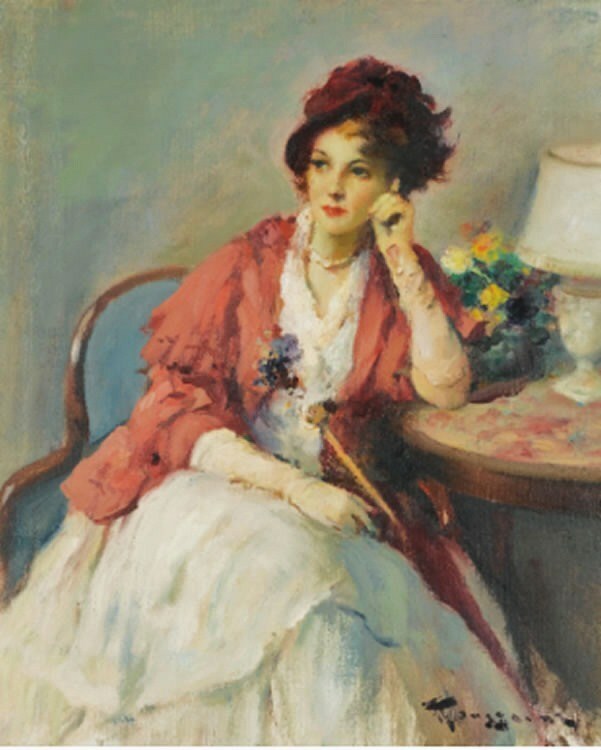 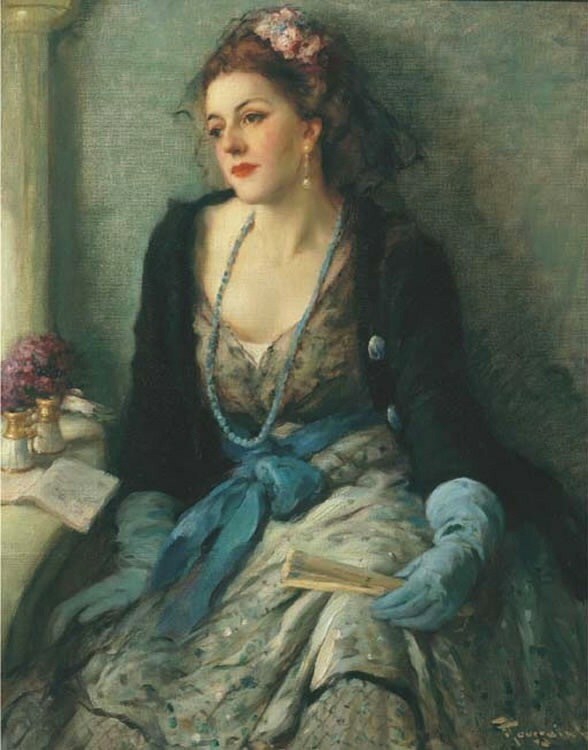 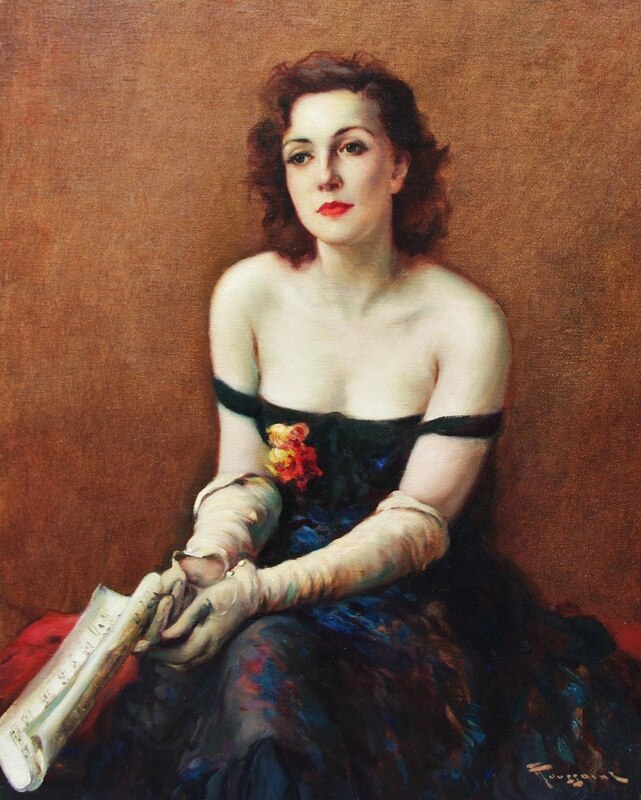 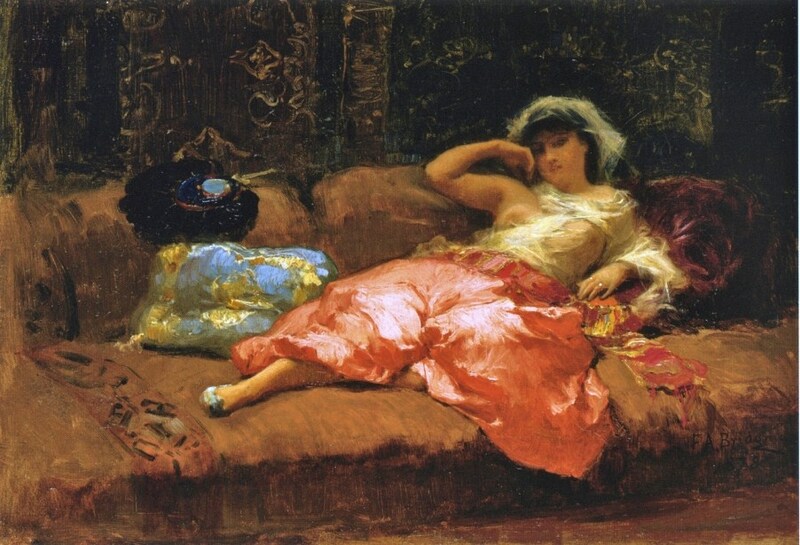 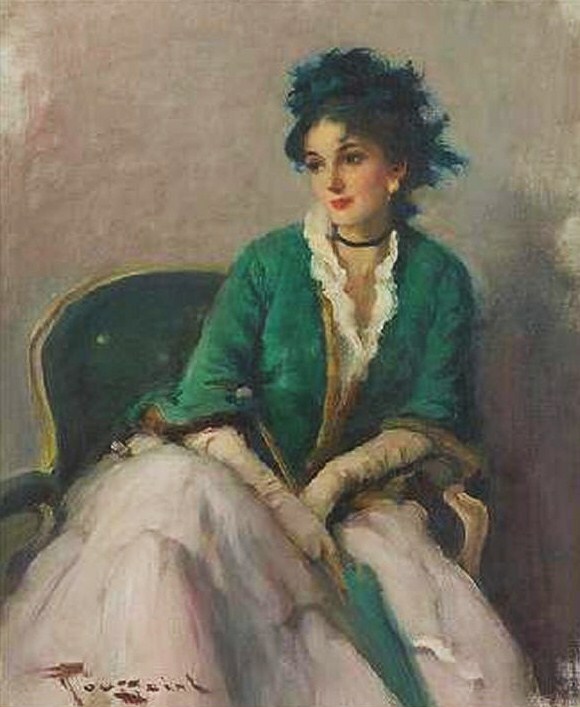 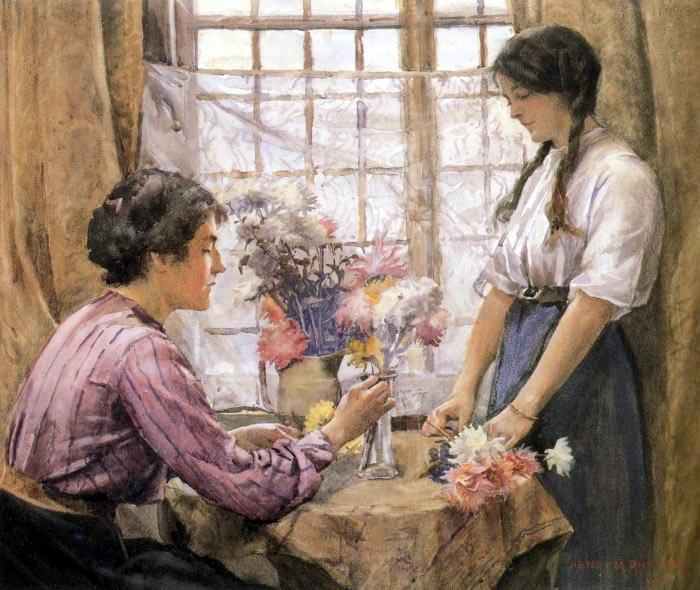 Post Impressionist Belgian painter Fernand Toussaint was born into a cultivated upper-middle class family in Brussels. 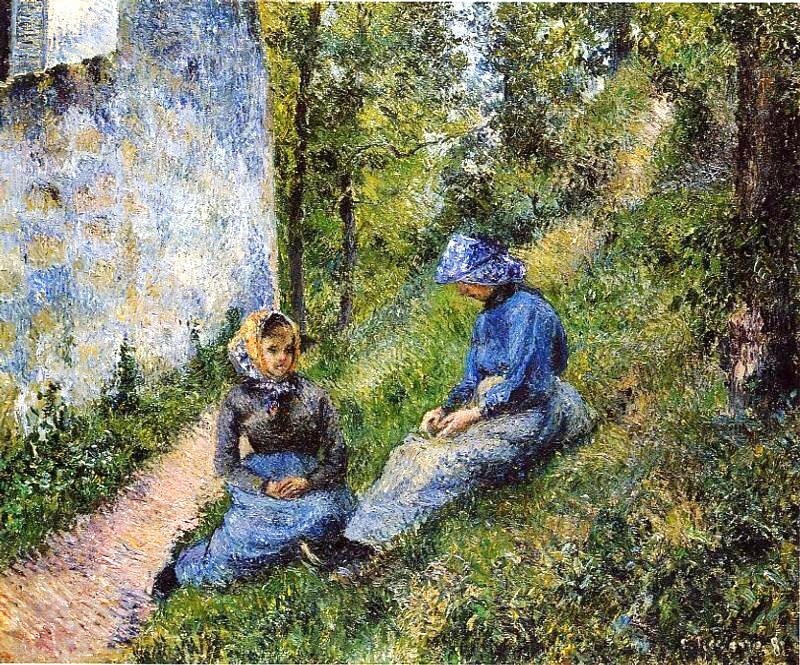 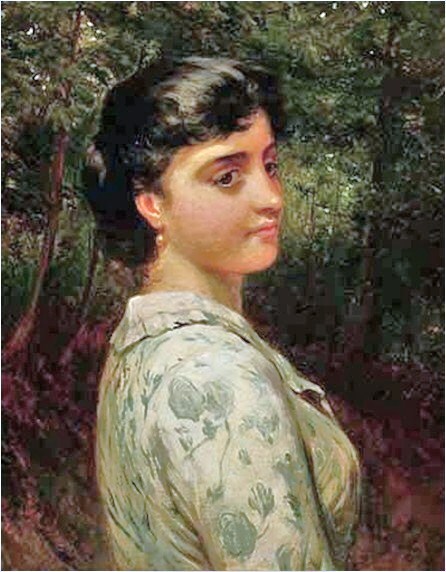 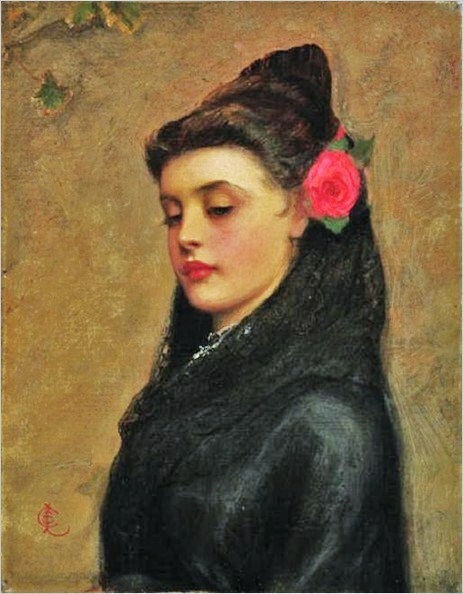 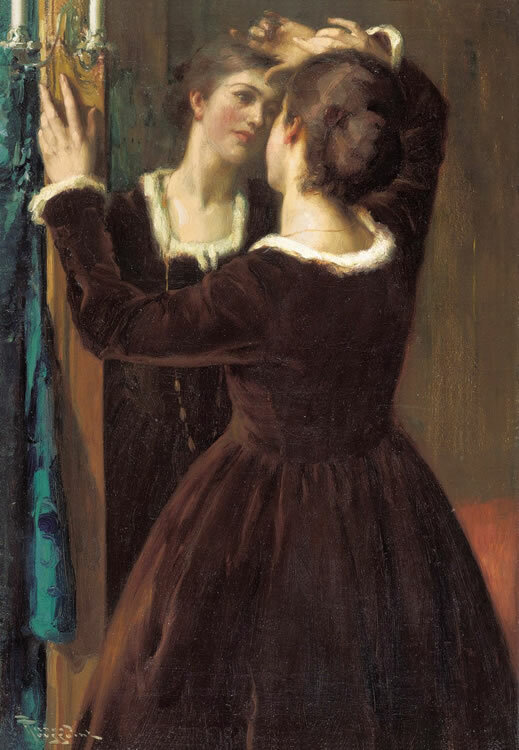 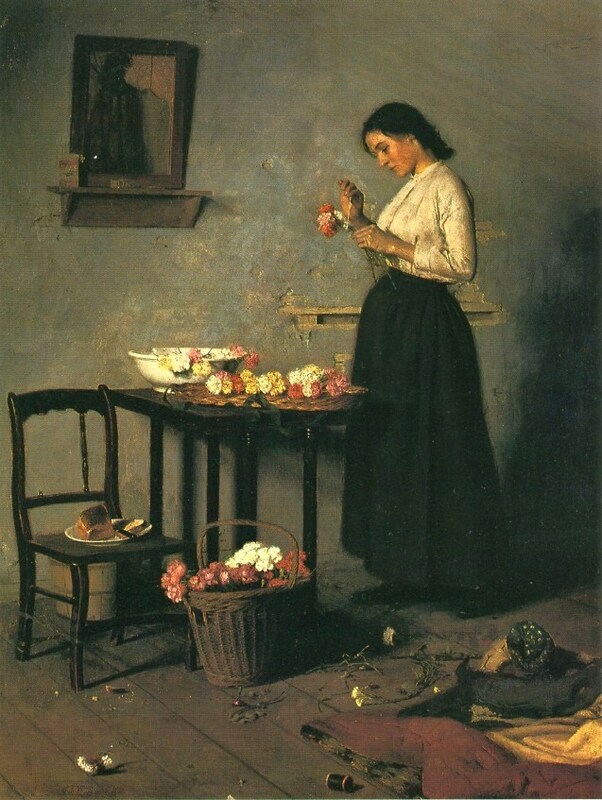 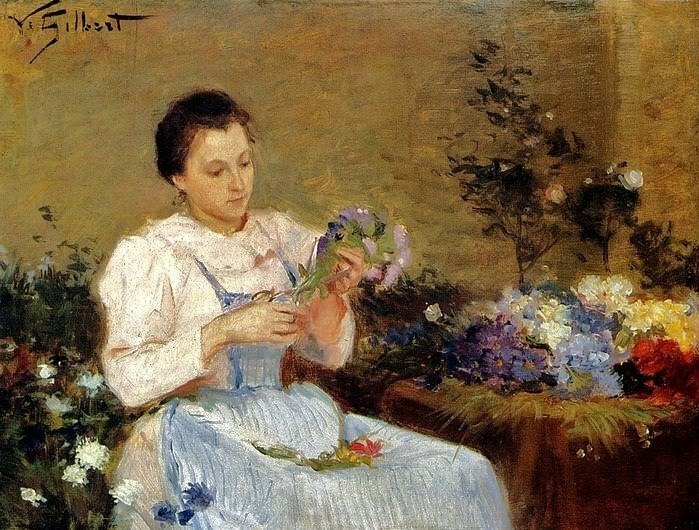 At the age of 15, Toussaint began his education at the Art Academy of Brussels under portrait painter Jean-François Portaels from 1889 – 1894. 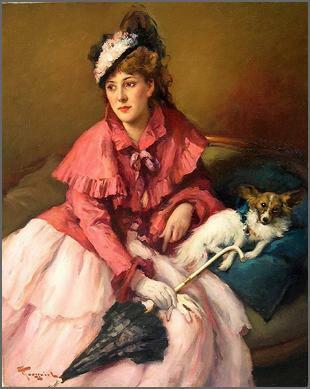 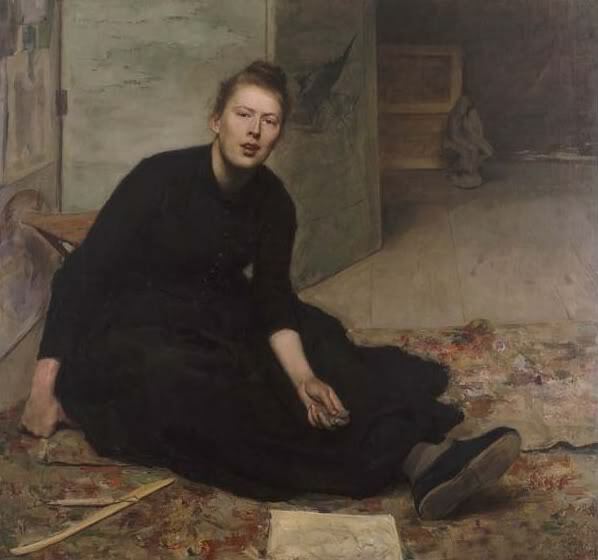 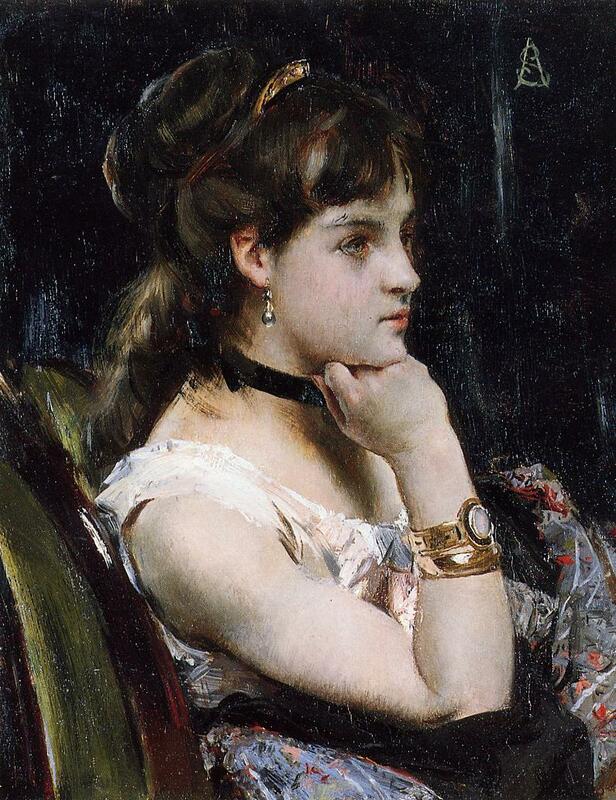 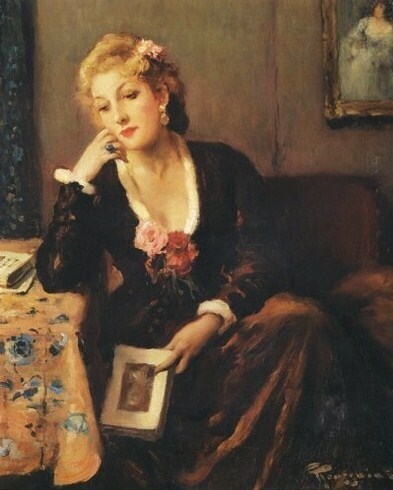 Toussaint left for Paris in 1891, continuing his studies under Belgian portraitist Alfred Stevens. 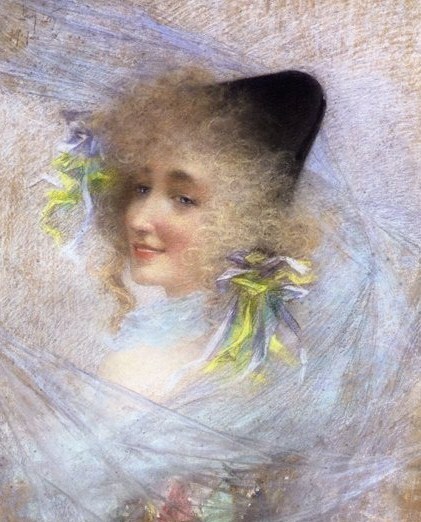 Toussaint divided his time between Belgium & Paris, often painting commissioned portraits for affluent members of European society. 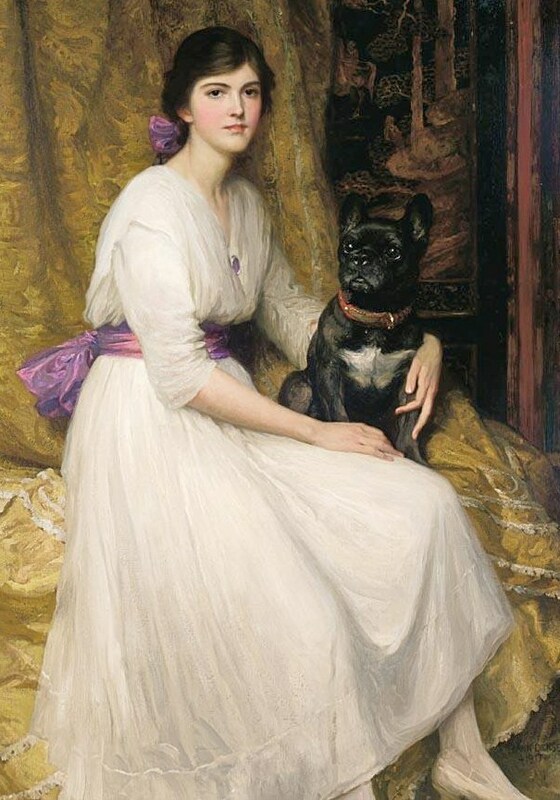 Some of his well-heeled clients requested their portraits with their dogs, and these remain. 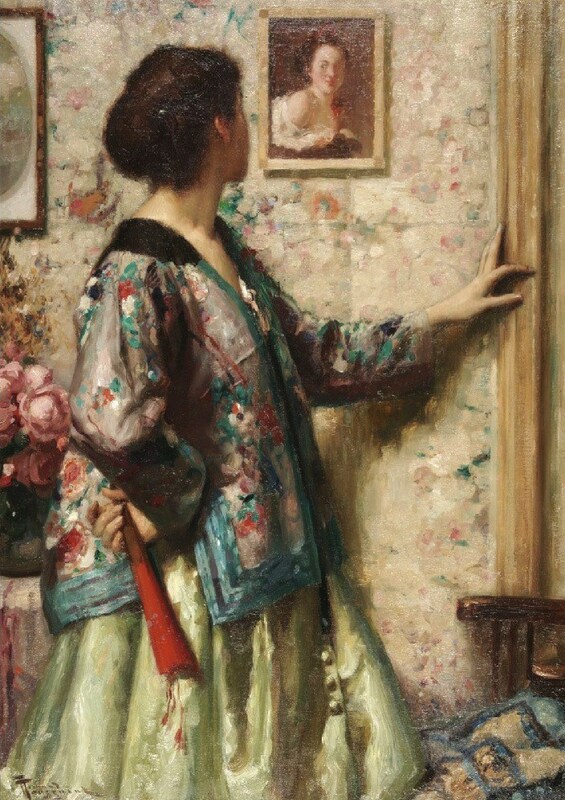 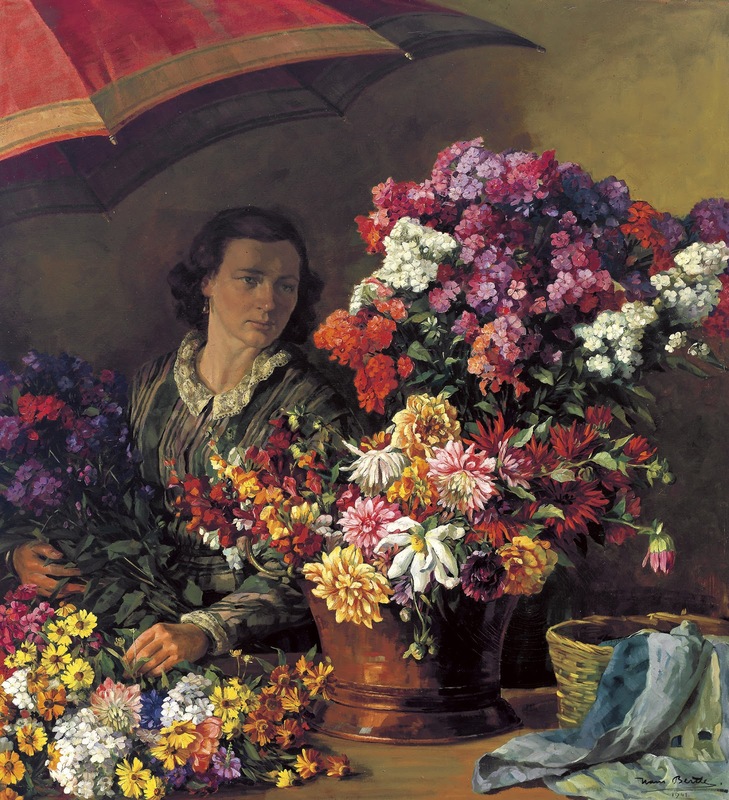 Well, here are women supported by all of the late-19th & early 20th-century popular portrait props – fans & mirrors & parasols & Japanese prints & books & flowers & more parasols. 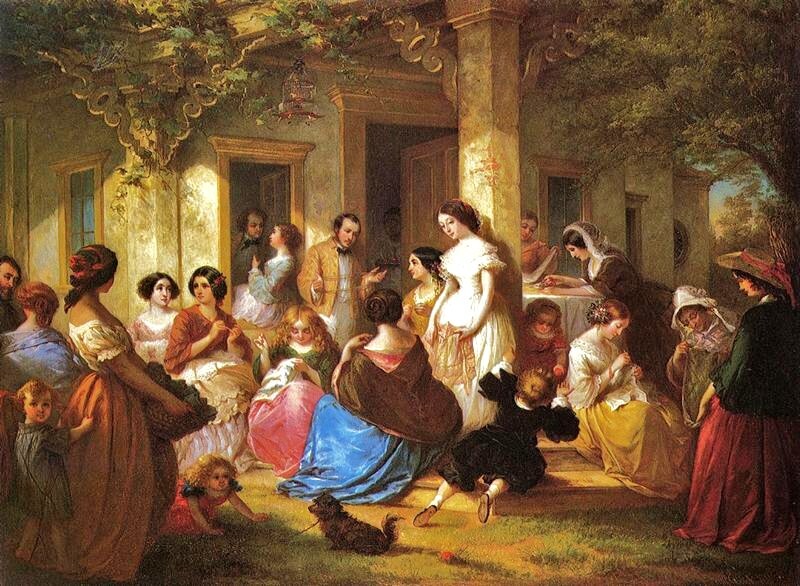 They are not underprivileged in any way, but most of them do not seem happy. 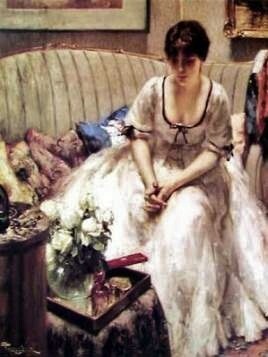 Most appear to be worrying & contemplating & depressed & lonely. 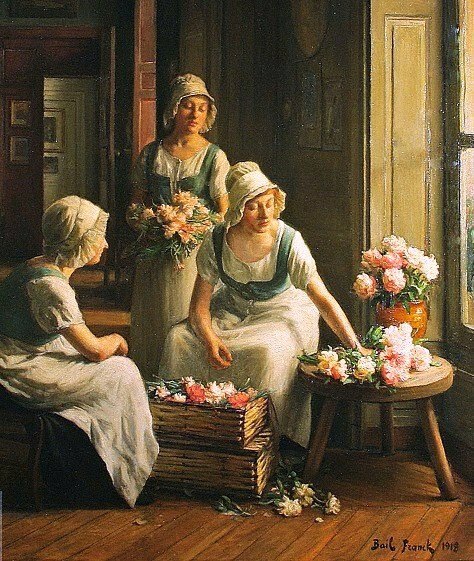 These ladies are certainly not the liberated European women of the early 20th-century, which we encounter in other portraits. 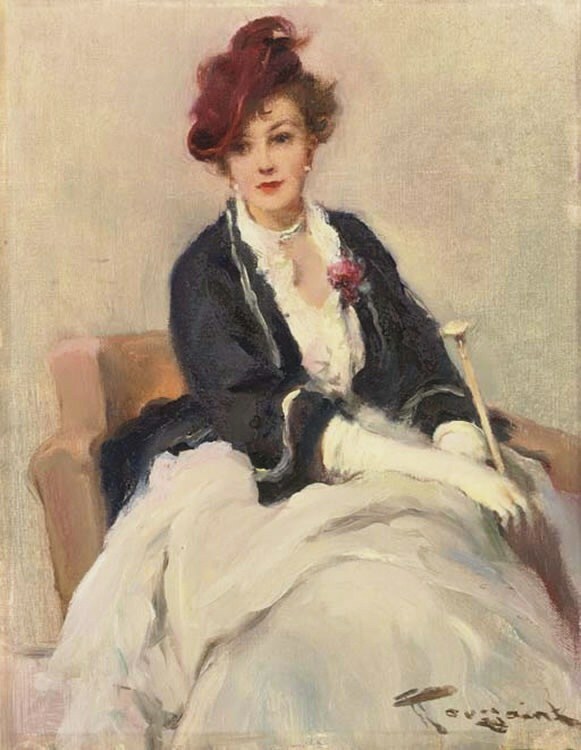 Post Impressionist Belgian painter Fernand Toussaint was born into a cultivated upper-middle class family in Brussels. 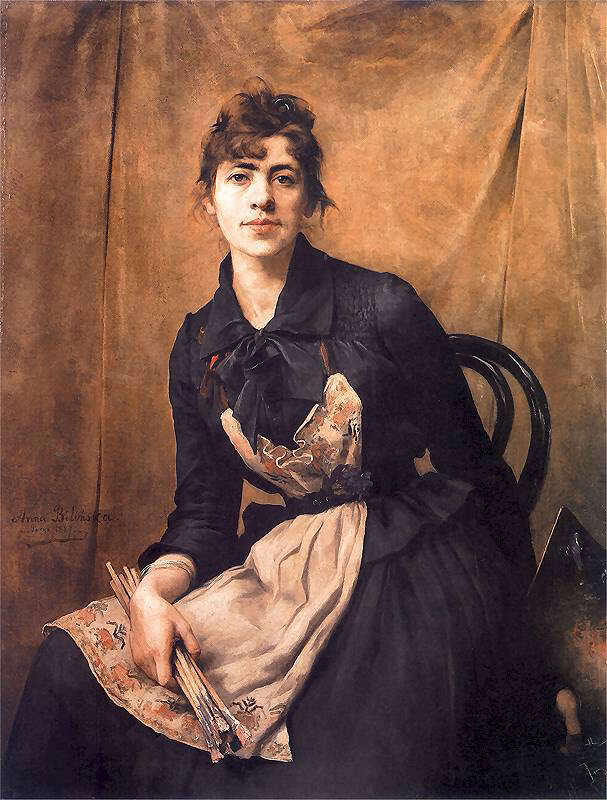 At the age of 15, Toussaint began his education at the Art Academy of Brussels under portrait painter Jean-François Portaels from 1889 – 1894. 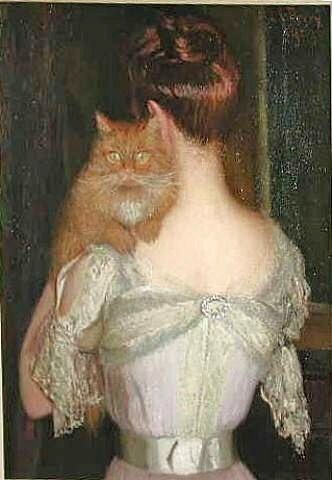 Toussaint left for Paris in 1891, continuing his studies under Belgian portraitist Alfred Stevens. 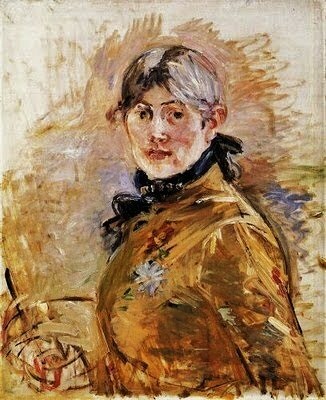 Toussaint divided his time between Belgium & Paris, often painting commissioned portraits for affluent members of European society. 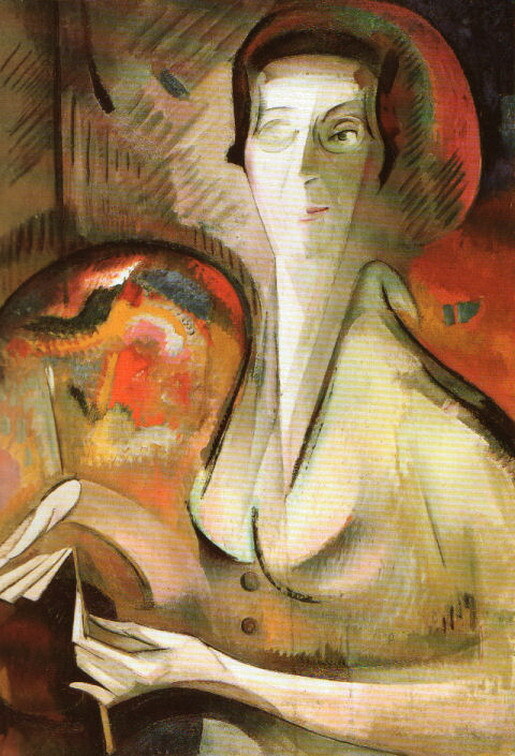 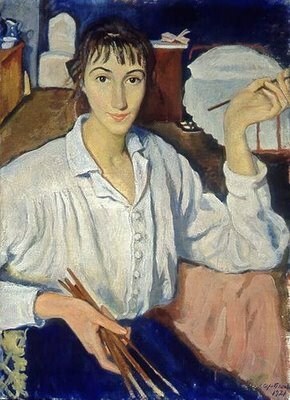 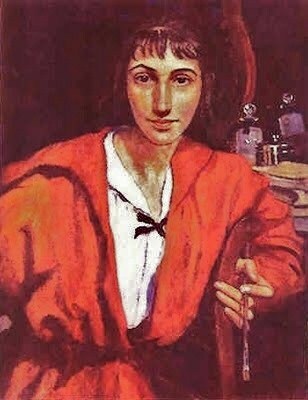 Avant-garde art magazines in Paris took notice of him, when he was awarded the gold medal for a portrait of a lady at the Salon des Artistes Français in 1929. 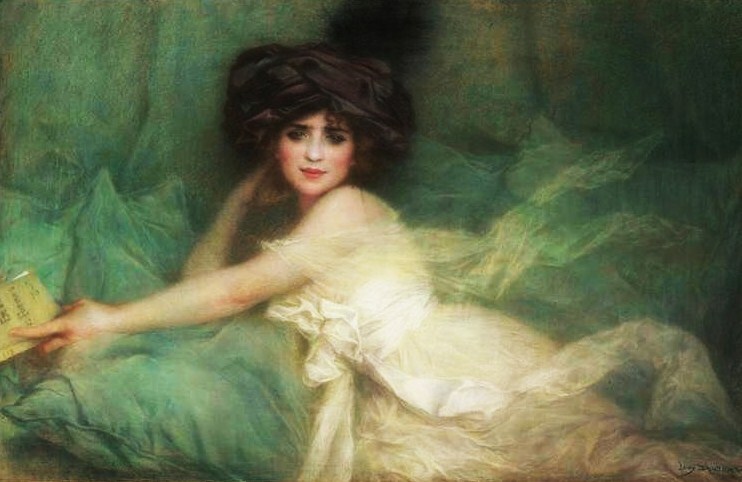 Throughout his career, Toussaint also painted marinescapes, landscapes, genre scenes, interiors, & still lifes. 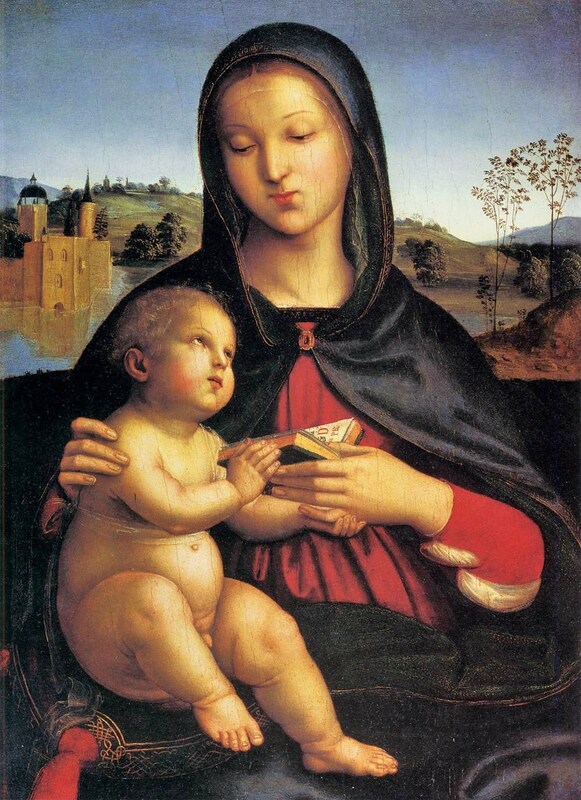 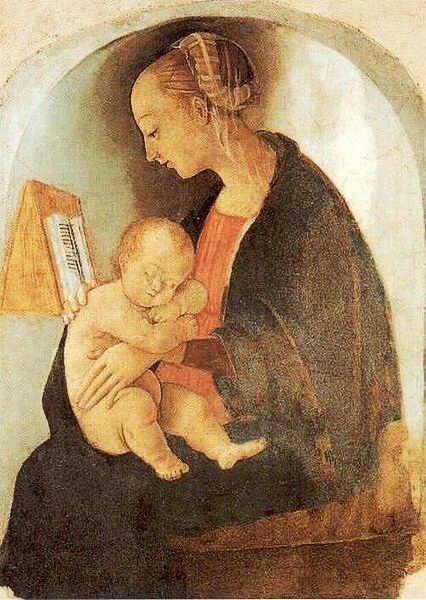 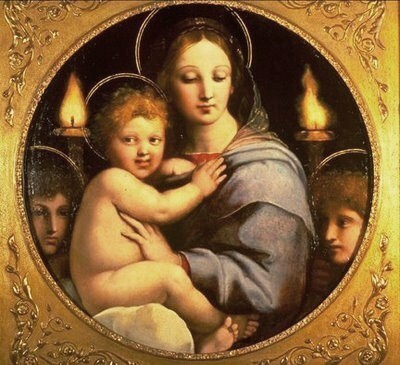 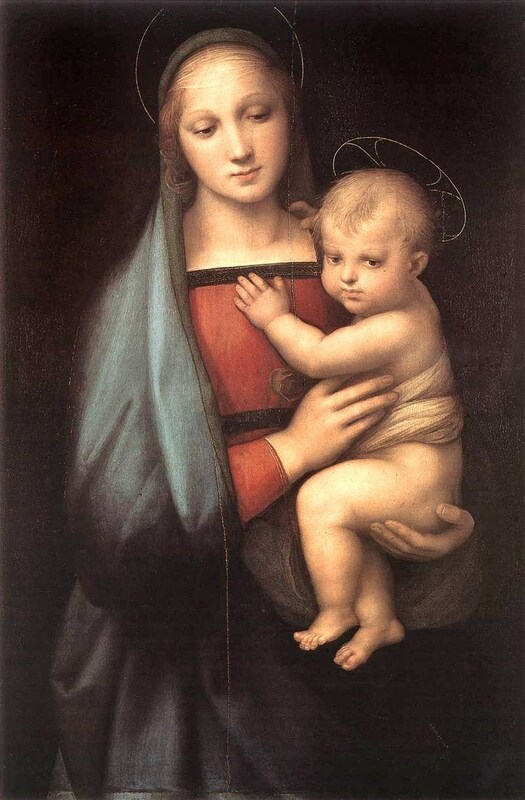 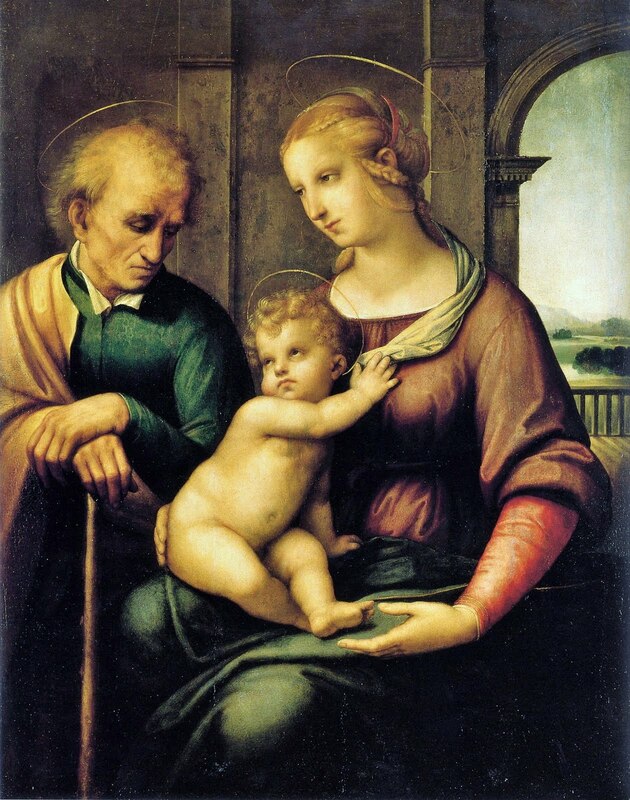 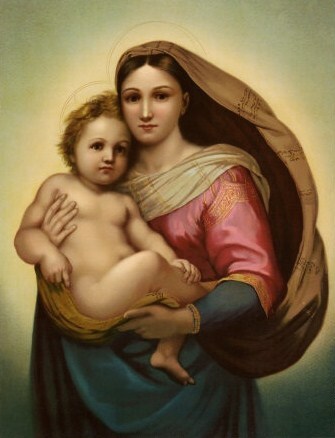 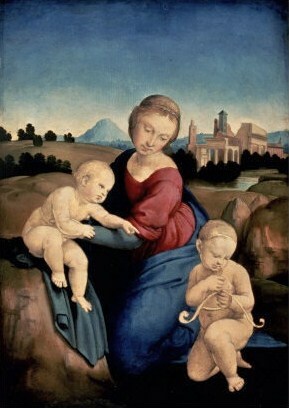 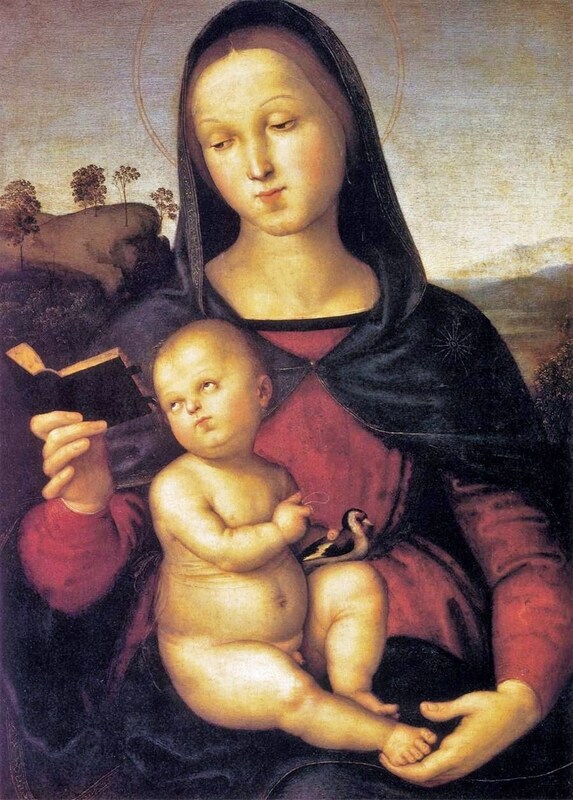 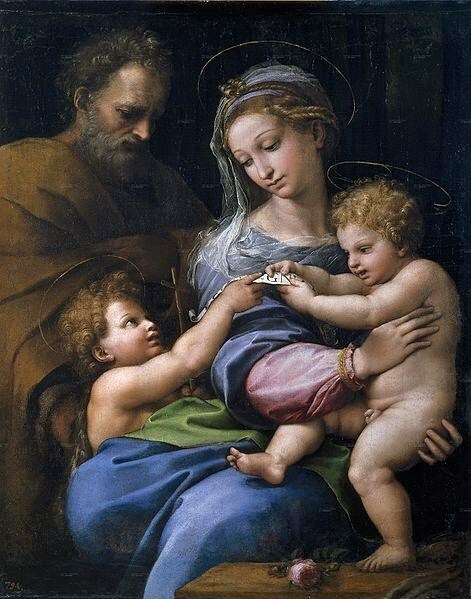 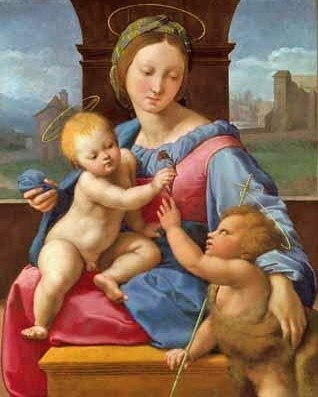 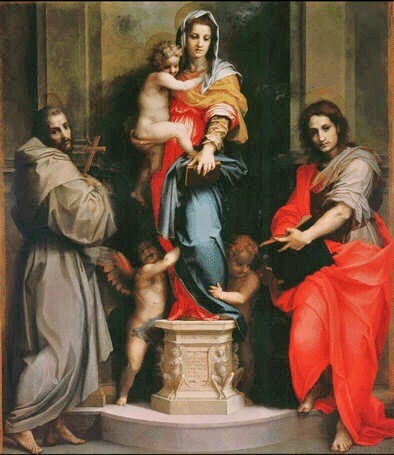 Die "Madonna del cardellino" oder "Madonna mit dem Stieglitz" ist ein Gemälde des italienischen Renaissance-Künstler Raphael, von c. 1505-1506. 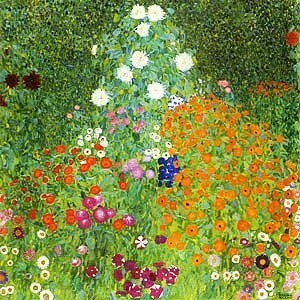 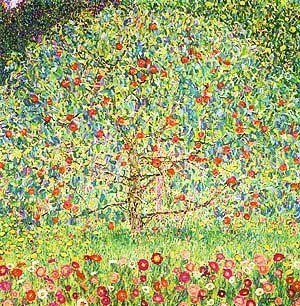 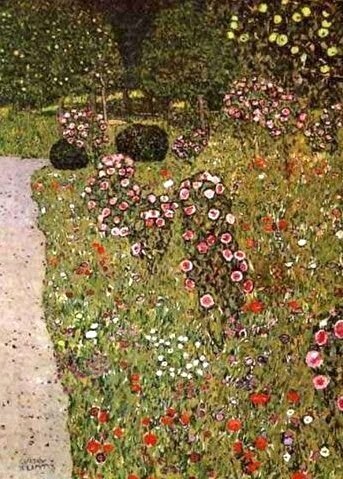 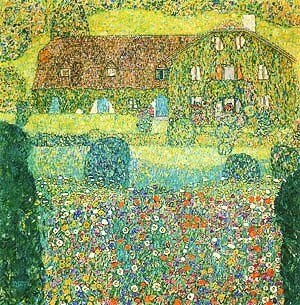 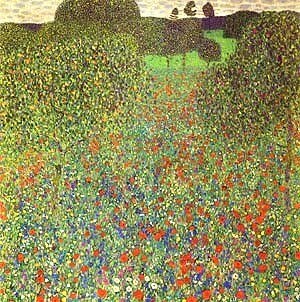 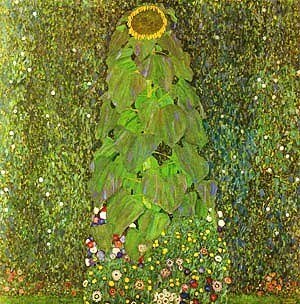 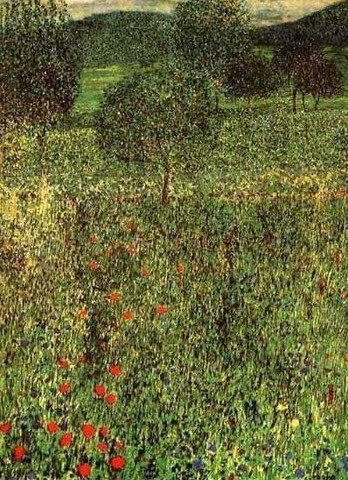 Gustav Klimt (Austrian Symbolist painter, 1862-1918). 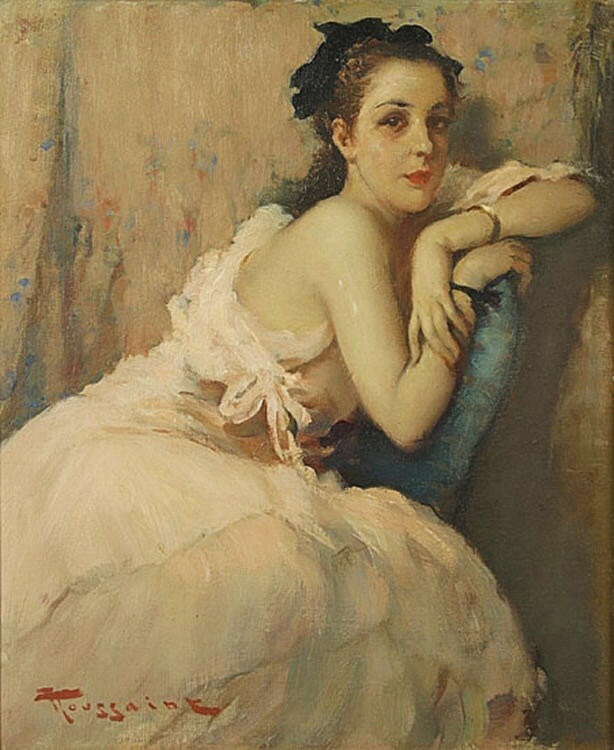 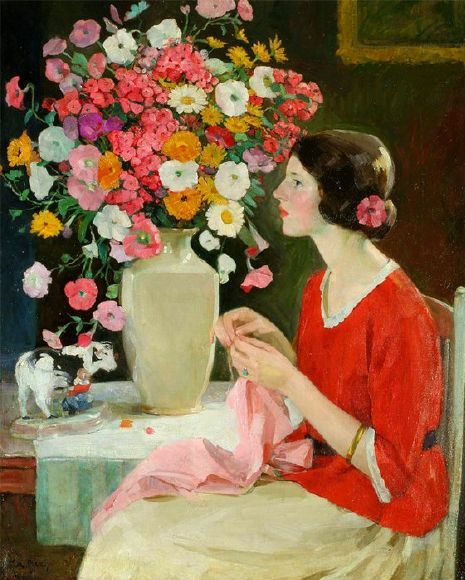 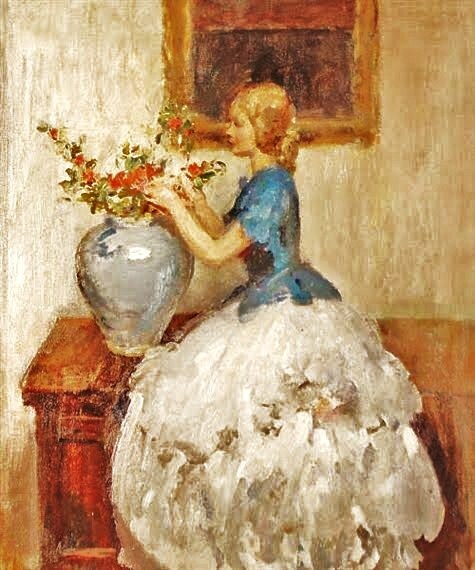 Francis Luis Mora (Spanish American artist, 1874-1940).